Star Wars Celebration Chicago is rapidly approaching — meaning it’s next week — and you’re pretty sure you’re ready. Your tickets are purchased, your hotel is set, and you’ve even pulled out all the novels and comics you want to get signed by your favorite authors. You’re all ready to start packing when suddenly you realize: you forgot to make cosplay plans! If you’ve been to Celebration or any other convention before, you know what a big role cosplay can play. Everywhere you look, there are people wearing costumes of their favorite character, some of whom even look like they walked right off the screen! It’s hard to not want to join in on the fun and pretend to be a Jedi or a TIE pilot or a smuggler with a spectacular cape. However, starting to work on your costume a week before the convention can feel a little intimidating. After all, some people have spent weeks if not months working on theirs. But fear not! An elaborate, screen-accurate costume may not be possible (unless you happen to have one sitting around) but you can still be a part of the costumed crowd. Here are a few tips for how to pull together a costume even though time is against you. 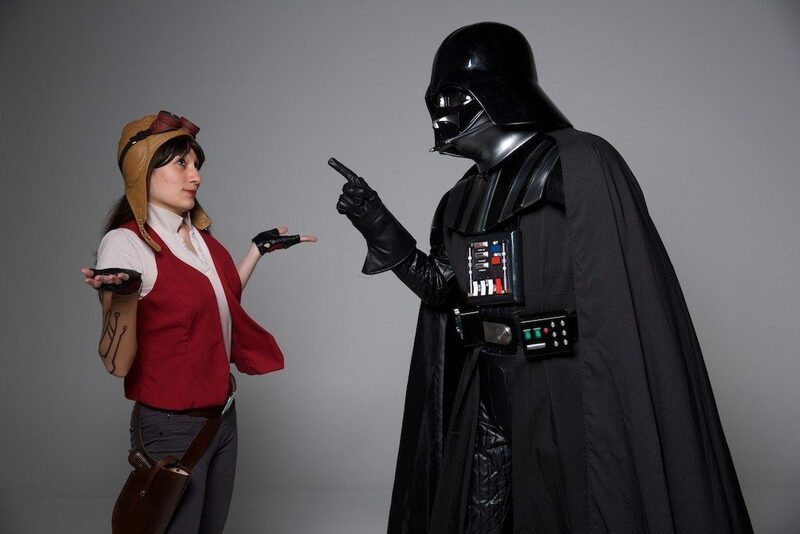 Bria as Doctor Aphra with a certain Sith Lord. Photo by Haythem Lafhaj. 1. Costuming should be fun! One of the most important things to remember about cosplay is that there is no one right way to do it! There are some people who only want to walk around in screen-accurate costumes and that’s awesome — but it’s not the only way. If you want to be a bathrobe Jedi, be a bathrobe Jedi and carry your lightsaber with pride! Above all else, cosplay is supposed to be fun. Do what make you happy because that’s what this hobby is truly all about. 2. Be realistic about your creating skills and pick a character you care about. If you’re comfortable with sewing or are familiar with creating armor, the possibilities for what you might create in a few days are more limited by time than anything else. If you’re a novice when it comes to sewing needles and craft foam, you’re going to be limited to mostly what you’re able to find or buy, so keep that in mind while you decide what character you’d like to be. That should be the first step, by the way: deciding which character(s) you want to cosplay as. It doesn’t matter whether you really love the character themself or their design or maybe what they stand for. You should love at least something about them, or what’s the point? You’ll want to keep a somewhat open mind as you go through the first few steps of the process but you should know who you’re aiming to be. 3. Examine your closet/what you already have. Thrift and discount stores are about to be your best friends, but start by taking a look at what you already have in your closet. For those who’ve done cosplay before, include old costume pieces in this inspection. You never know what you might be able to repurpose. If you have a lot of black, perhaps the good guys aren’t in your costuming future for this particular Celebration. If you’ve got a lot of earth tones or perhaps some bright orange, the Rebellion may be your destiny. Think outside of the box as you go through your things. A black shirt doesn’t have to be just a black shirt; it could be the top for Imperial officer with just a little bit of tweaking. 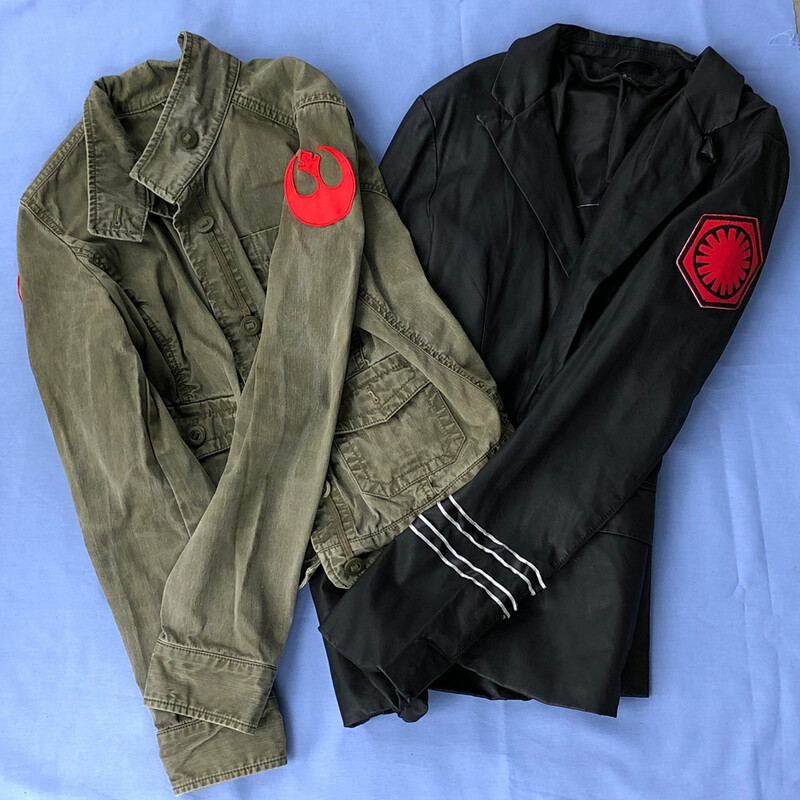 An olive drab jacket could be the perfect touch for a member of the Rebel Alliance or Resistance. 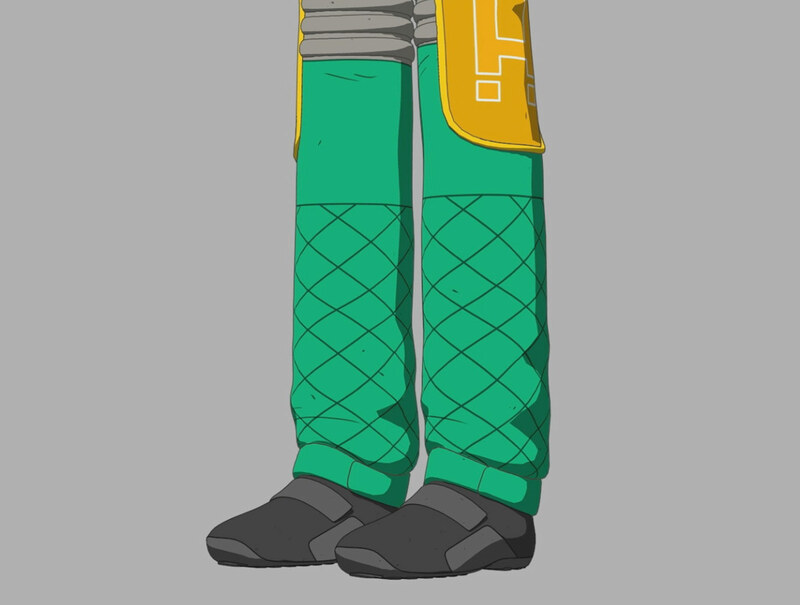 That vivid green jacket could be the start of a Kaz Xiono costume. The ladies may have a slight leg up in this department thanks to Her Universe’s many costume-ready offerings over the years. This is the perfect time to break out that Sabine Wren tunic or that Ahsoka Tano dress or the Hoth Leia vest. If you’re using an article of clothing like one of those, the job’s half done and it’s just a matter of picking out shoes and accessorizing appropriately. 4. Hit up your local shops. Thrift stores can be life-savers when it comes to costuming, but it could take a bit of time and digging to find what you’re looking for — and time is running out. The same applies to discount department stores. Again, keep an open mind as you go through the racks and think about what could work and keep your expectations reasonable. 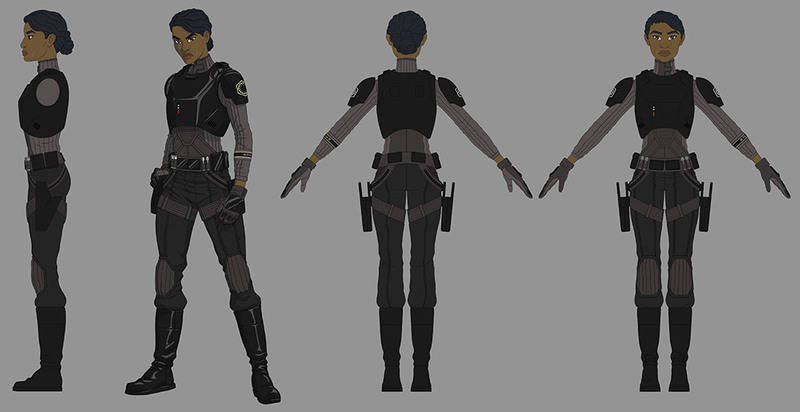 It’s unlikely that you’ll find a pair of flared black jodhpur pants to complete your Imperial officer uniform, but you might find a pair of gray pants to pair with your Ahsoka tunic. Be sure to also keep an eye out for boots as they’re something almost everyone in Star Wars wears but you might not have on hand. 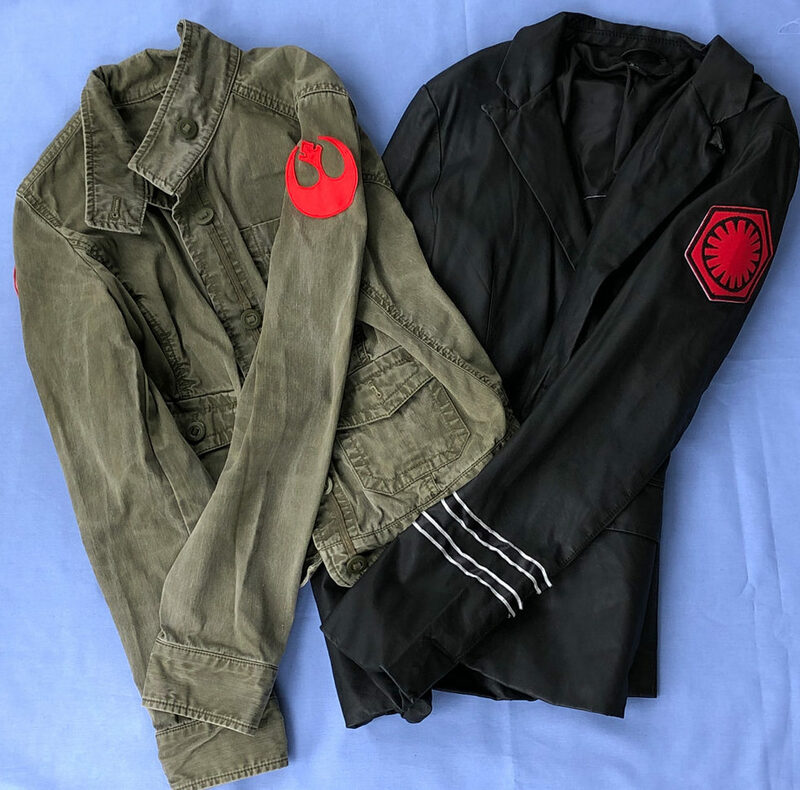 If you’re looking to go as a pilot or a member of one of the galaxy’s militaries, check out an army surplus store or somewhere that might sell jumpsuits. 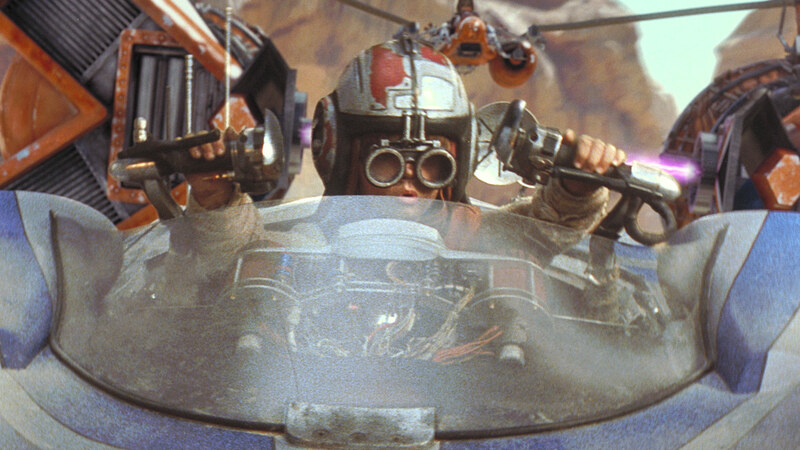 A rolled down orange flightsuit, T-shirt, and black boots can instantly turn you into an off-duty x-wing pilot. 5. Think about what you may be able to easily find on the convention floor. If there are only mere days before you leave for Celebration, it may be too late to order more specialized things like blasters or patches. 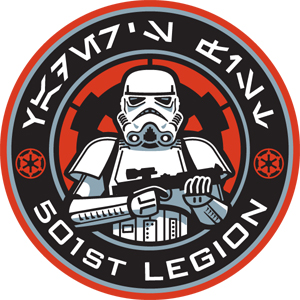 However, Rebel Alliance and Galactic Empire crest patches are easily found from vendors. Bring along a needle and thread and voila! Your costume could be complete within minutes of arriving. 6. It’s all about capturing the character’s vibe. 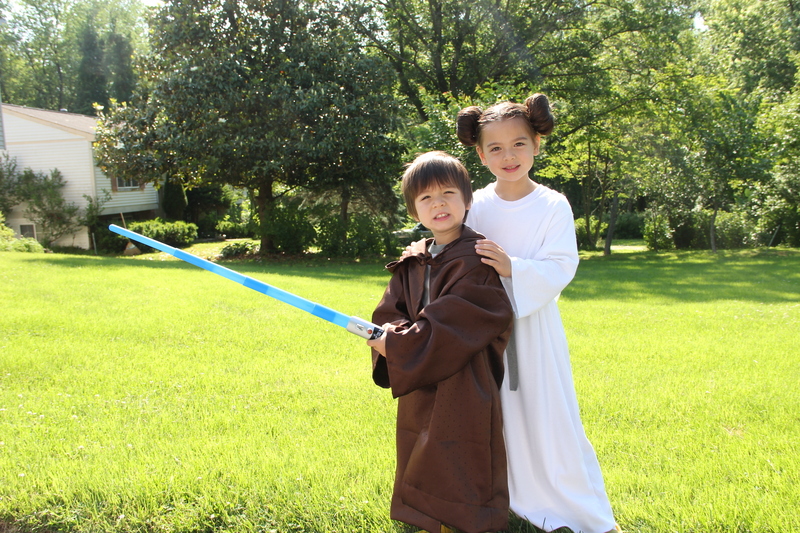 Don’t limit yourself to the galaxy far, far away when it comes to the style of your costume. You can still embody Anakin Skywalker without trying to mimic his Jedi robes or feel like Kylo Ren without having to wear all of those pleated and quilted layers. Bring the character into our galaxy. 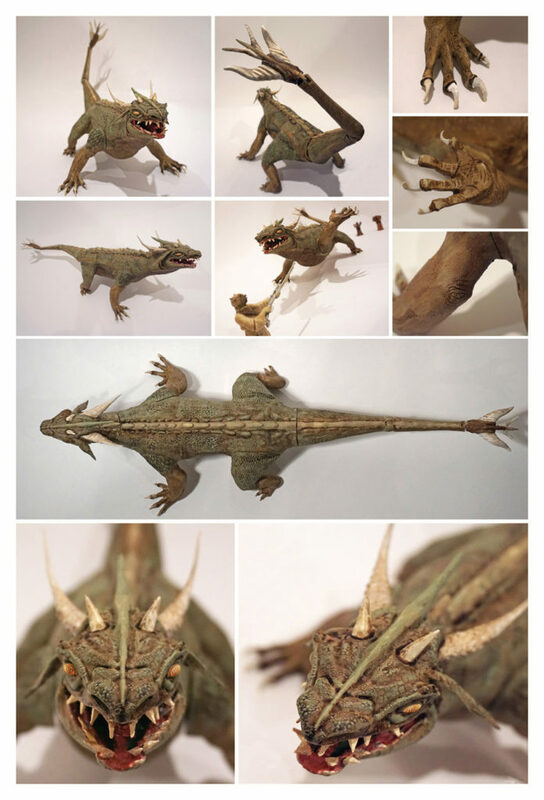 If you’re unsure of what this entails, take a look at fan art for some inspiration. You can find everything from 1950s Padmé to modern day Poe Dameron. Think about what some of the key visual elements for your character of choice are. For Rey, that may be her triple bun hairstyle and her signature arm wraps. 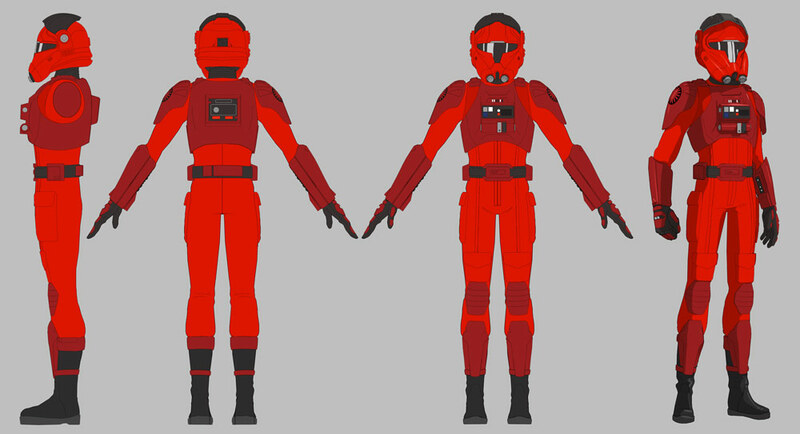 For a member of Inferno Squad, it’s likely their uniform’s striking black-and-red color scheme (and handily enough, black clothes with red stripes down the side has been in fashion lately.) As a bonus, wearing a modern day version of your favorite character also means you’ll likely be more comfortable too! 7. The details can make the outfit. And that should put you on your cosplay way! Don’t forget to practice your poses for any picture requests — and to have a blast pretending to be a part of the galaxy far, far away. 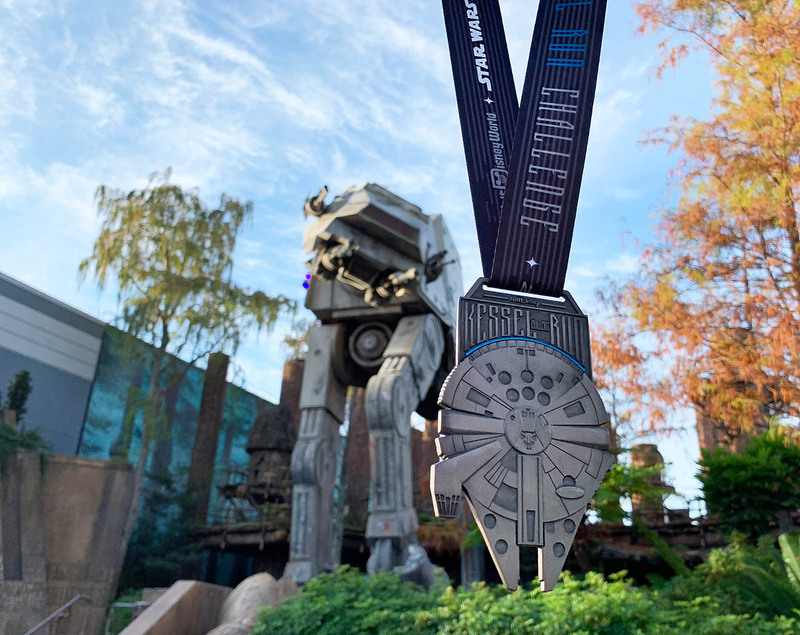 It’s almost time to trek to Orlando, Florida, lace up your running shoes, and hit the course for runDisney’s Star Wars Rival Run Weekend, beginning this Thursday! As you finish the last of your training runs, here are 7 things to remember heading into race weekend. 1. You’re there to have fun. Scoring medals and clocking personal bests can be exhilarating, but when the going gets tough, remember — this race is about having fun! Take a moment to look around you. You’re running through Walt Disney World Resort, surrounded by other fans and friends who share your passions. Is there anything better? 2. Don’t forget your well-worn running shoes! Race day calls for a pair of sneakers that have just the right amount of wear — broken in but not busted. Because no one likes blisters from new shoes, especially when they’re trying to get to the finish line. 3. This isn’t the time to try a new outfit. It’s the same idea for your running gear, whether you’ve picked a costume or decided to go with the standard sweat-wicking shirt and shorts. A race is not the time to try a new outfit for the first time and discover that it rubs, sags, or is generally uncomfortable. Pack only your favorite gear. 4. If you need it for a training run, you need it for race day. I have a brief checklist of things I always grab before I head out on a run: one handkerchief for every 3 miles I’m planning to complete, a healthy dose of sunscreen of at least SPF 70+, headphones, my Garmin, and a water bottle for longer runs that don’t have any fountains along the route. 5. Set a goal and try to meet it. If you want to try to clock a certain time, set your pace and try your best to achieve it. If you just want to finish, keep your eye on the finish line. 6. But as the great Jedi Masters have said, “You must have patience!” Be kind to yourself, whatever you’ve set out to accomplish, and remember that slow and steady will get you there. Don’t overexert yourself. If you find yourself feeling sluggish at the starting line, or even partway through, there’s no shame in walking. 7. Hold onto that feeling of accomplishment. Not an early bird? Starting your run at 5:30 a.m. is not going to be pleasant if you normally prefer to stay in bed for as much of the morning as possible. But when you cross that finish line, you’re going to feel a sense of pride and accomplishment that will carry you through your day. And if you lay out your gear the night before, as well as anything you’ll need to get to the starting line, you’ll have a much smoother start. 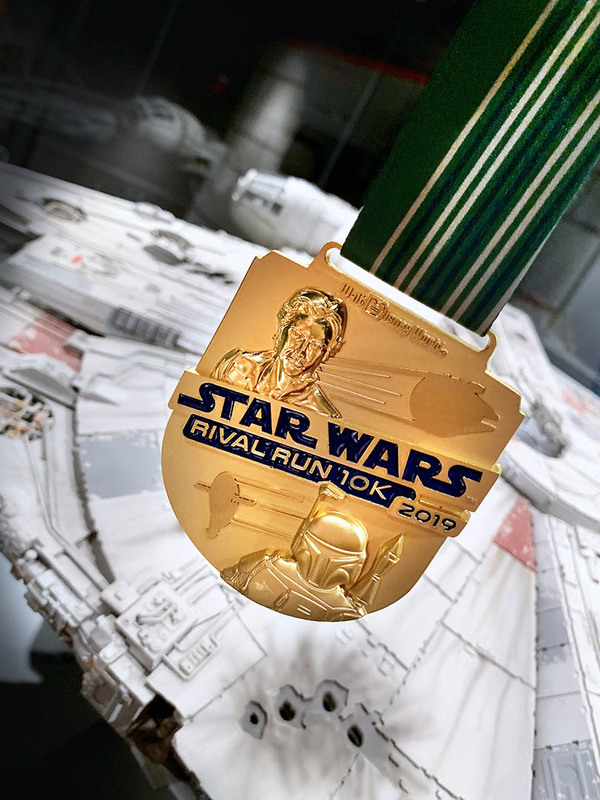 Star Wars Rival Run Weekend takes place April 4-7, 2019 at Walt Disney World Resort. Cosplay Command Center is a special three-part series connecting cosplayers attending Star Wars Celebration Chicago to resources and expert insights to complete their costumes from Star Wars animation. It’s been almost a year since we said goodbye to Ezra, Hera, and the rest of the Star Wars Rebels gang with the series finale of the beloved show. But in a few weeks, when fans gather to celebrate the Star Wars saga, we can expect that there will be a few Kanans, Sabines, and other cosplayers roaming Chicago as the Ghost crew. 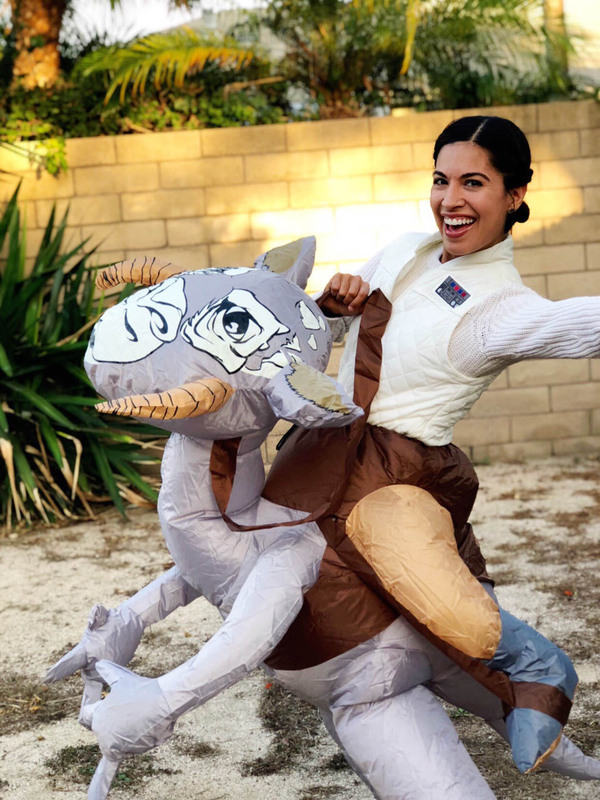 Last week, Amy Beth Christenson helped fans achieve their dreams of joining the Aces in Star Wars Resistance, with insights and images to guide cosplayers in their crafty creations ahead of Star Wars Celebration Chicago. 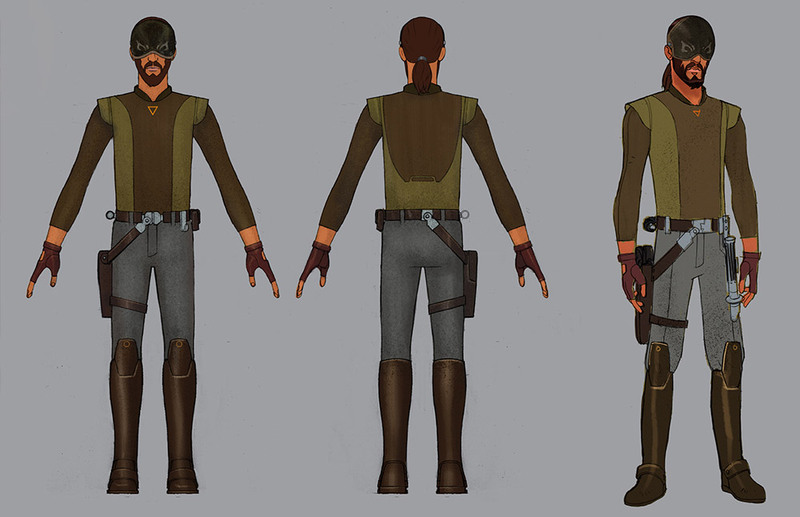 Today, Plunkett offers up his own Jedi-like guidance to recreate some of your favorite looks from the final season of Star Wars Rebels. 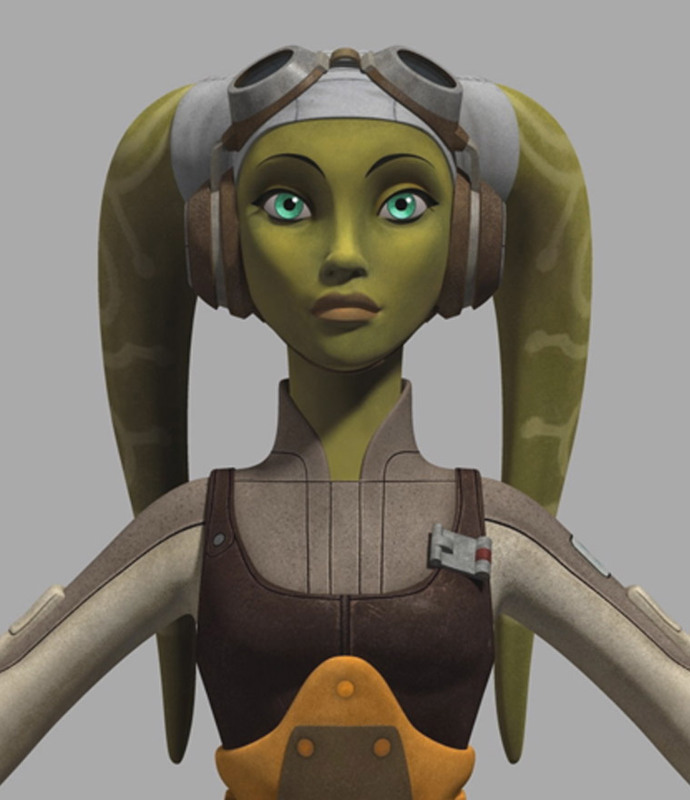 In this case, Hera’s flightsuit would be fashioned from the same heavy canvas suits that were worn by the rebels in the original trilogy. 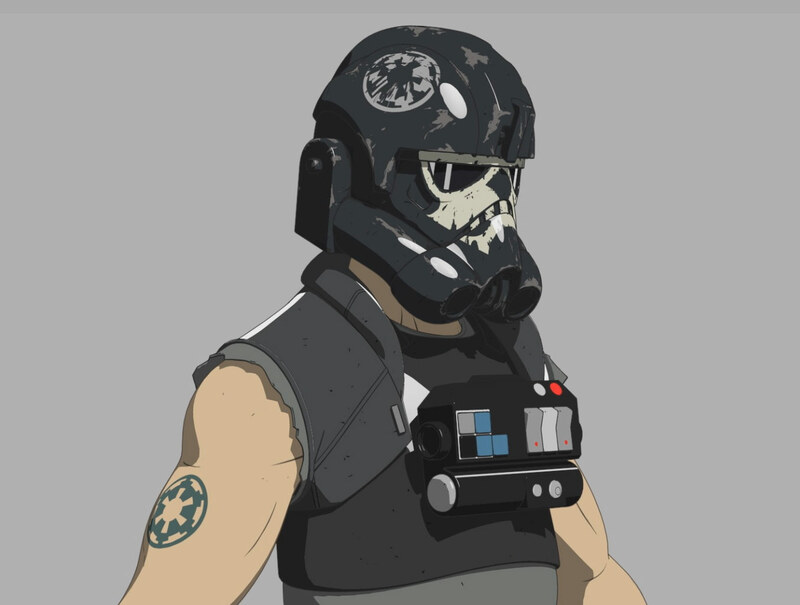 “The chestplate and ‘cheeks’ of the helmet would be the same material as that found on other live-action rebel flight gear,” Plunkett says. The vest should be a close match to a typical X-wing pilot. 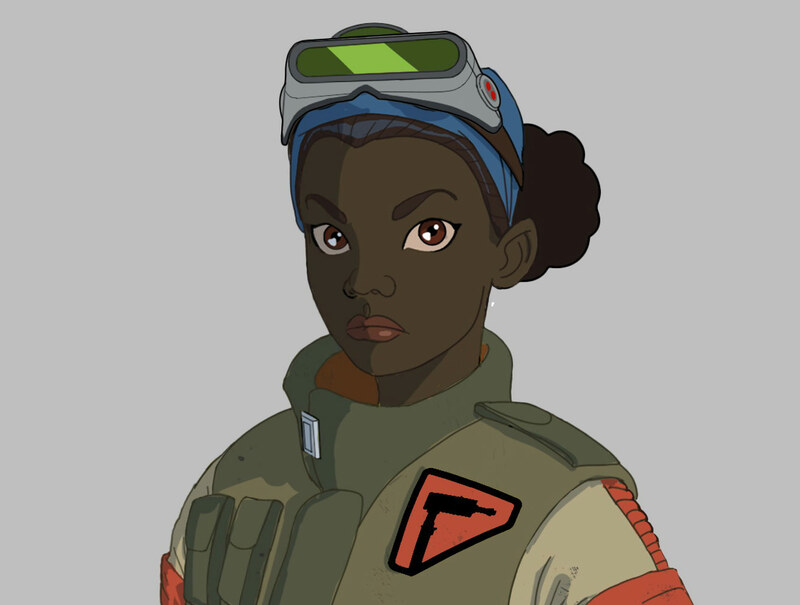 Hera’s standard harness and vest should be crafted from a brown leather or leather-like material, made to match her gloves, goggles, and earphones. To complete her head covering, add in some cotton or canvas stitched to hug your faux lekku. 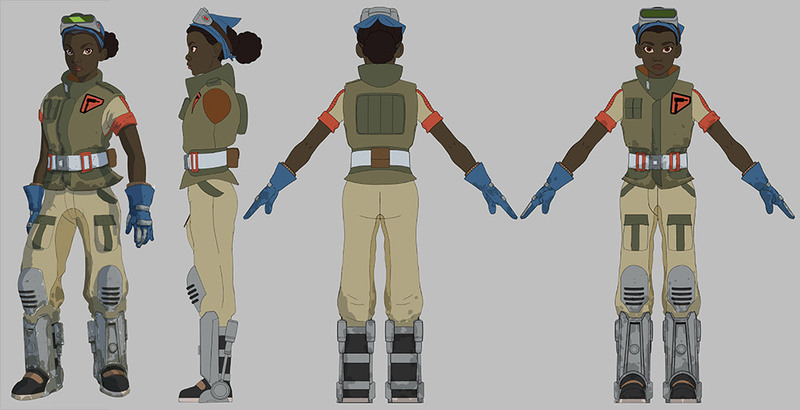 And for aging her gear to match her final look in the series, “looking at the various outfits in Rogue One should give you a good idea of the amount of weathering all of Hera’s gear would display after all her time on the front lines of the Rebellion,” Plunkett notes. Click here for the full cosplay reference guide as a downloadable/printable PDF. 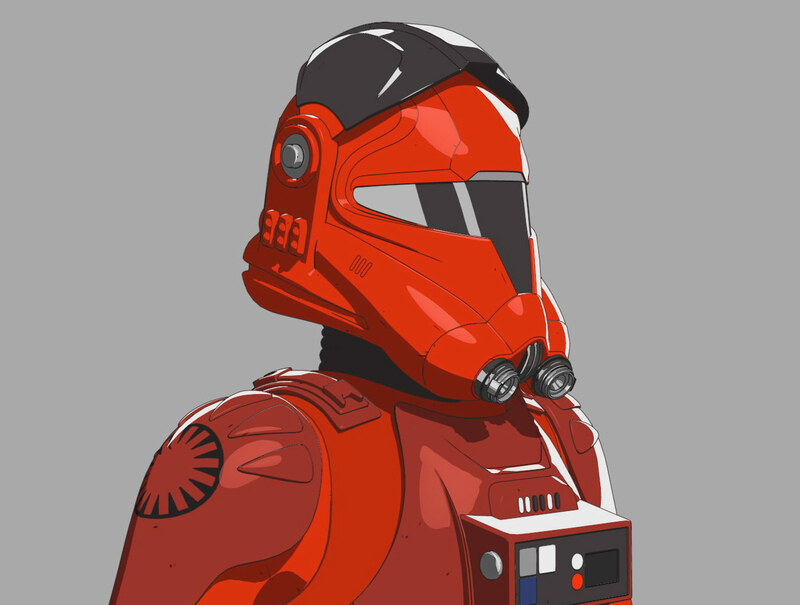 Although his wolf patch would be ironed on or embroidered in place, “the painted decal on his shoulder is courtesy of Sabine and can have a hand-painted look,” Plunkett says. 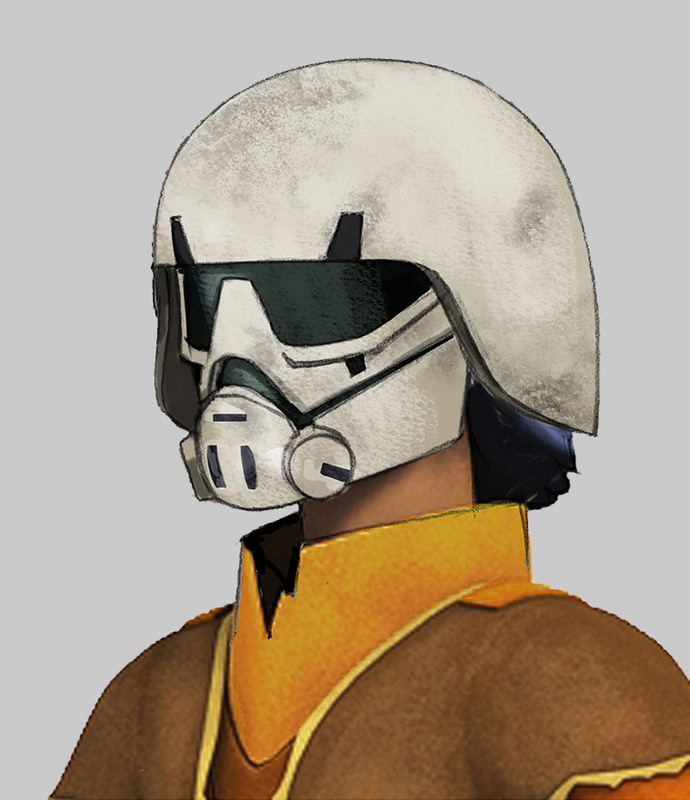 Ezra Bridger was a collector of Imperial buckets, including this special helmet with retractable visor, perfect for sneaking around and avoiding detection. Deep cover inside the Imperial Academy calls for a full cadet uniform. 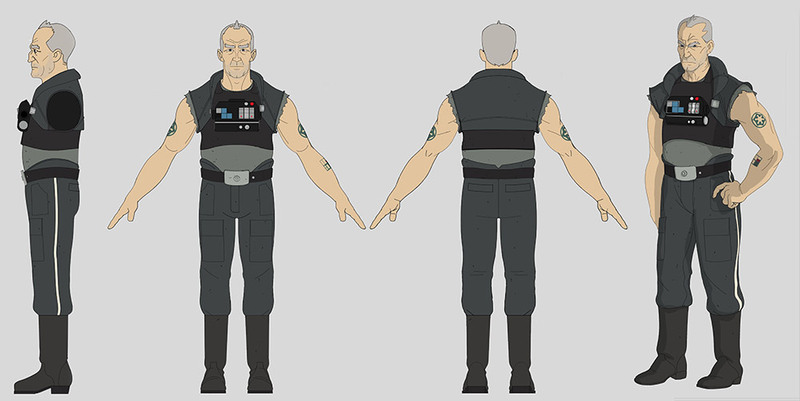 “This is an Imperial uniform, very much along the lines of Yularen or Krennic,” Plunkett says, “so the fabrics and construction would closely match those seen in A New Hope and Rogue One.” A sturdy pair of black leather boots, matching gloves, and a jacket fashioned from wool or canvas make up the bulk of the ensemble, with accents including metal buckles and the appropriate rank insignia. But Plunkett notes that Ezra’s longer locks are decidedly not up to the Empire’s standards. “I doubt that Ezra’s shaggy haircut would have lasted too long if he’d stayed in the academy,” he says. 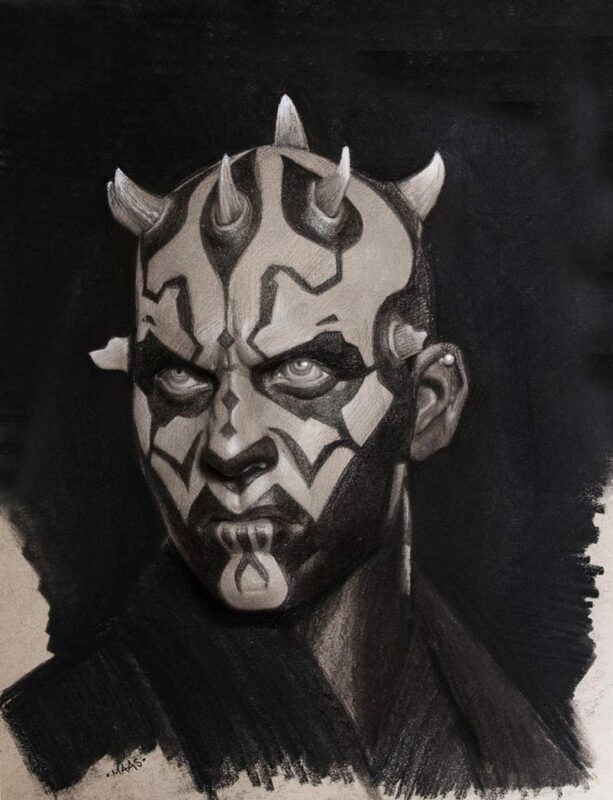 Viciously attacked by Maul at the end of the second season, Kanan spent the rest of the series blinded and often wearing a special mask with painted accents. To upgrade a Kanan cosplay to match this look from later in the series, Plunkett suggests forming a faceplate with a material similar to Jango Fett’s helmet — metal lined with leather padding — instead of the more plastic-like looking material of a stormtrooper or Royal Guard helmet. 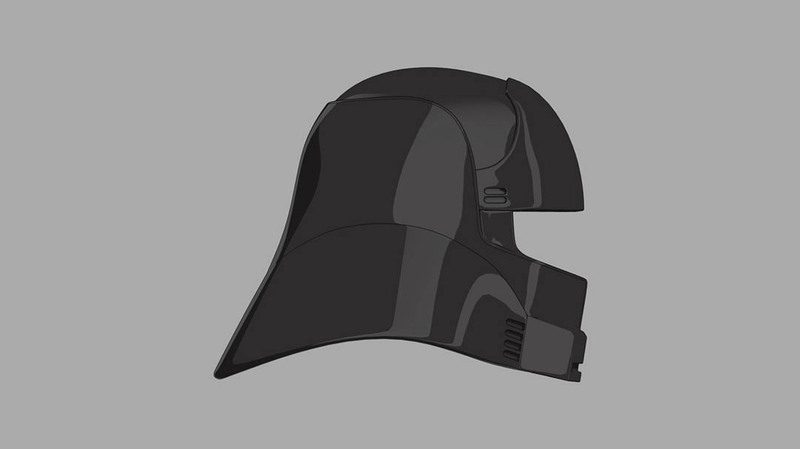 For cosplayers who need the extra support, “a real-life solution would be to use a brown leather strap to attach the faceplate to the head,” Plunkett says. 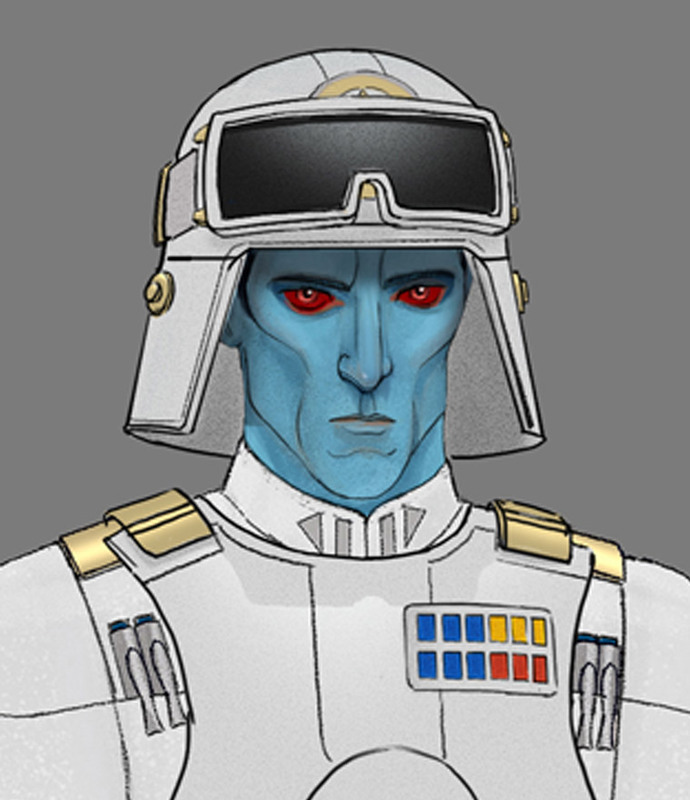 Thrawn’s cold and calculating personality comes through on the battlefield as he channels another efficient Imperial officer who once marched his AT-AT across the snowy plains of Hoth — General Veers. The accents share similarities with the Chiss commander’s standard tunic, down to pale gold clasps on the shoulders and accents on the helmet that should match his usual gold epaulettes. 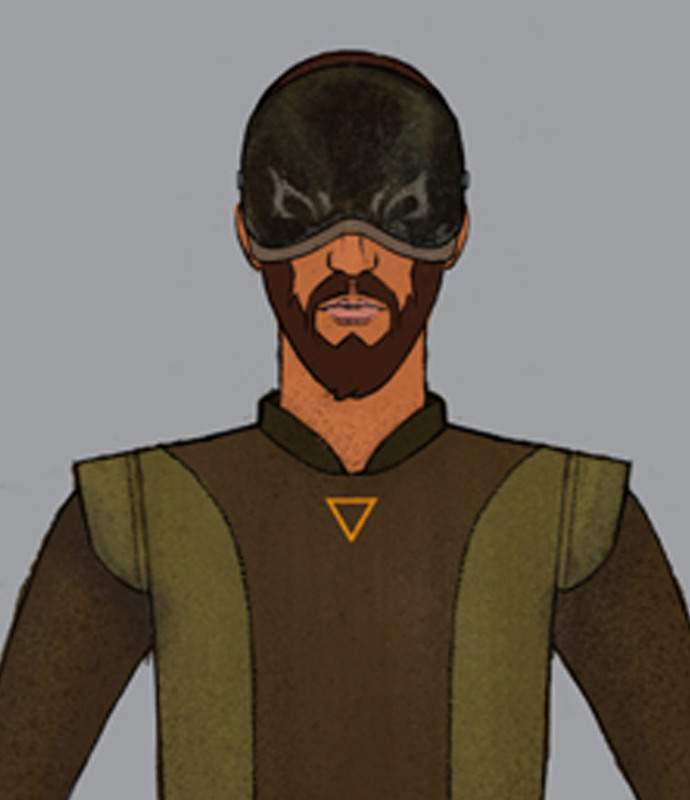 To make a costume that’s more of a live-action interpretation, Plunkett would add back in some details that were stripped away for animation. “The chin-strap, the small microphone/earpiece and the ‘lip’ that runs on the edge of all the armor sections would all translate really well into a realistic interpretation of this character, I think,” he says. 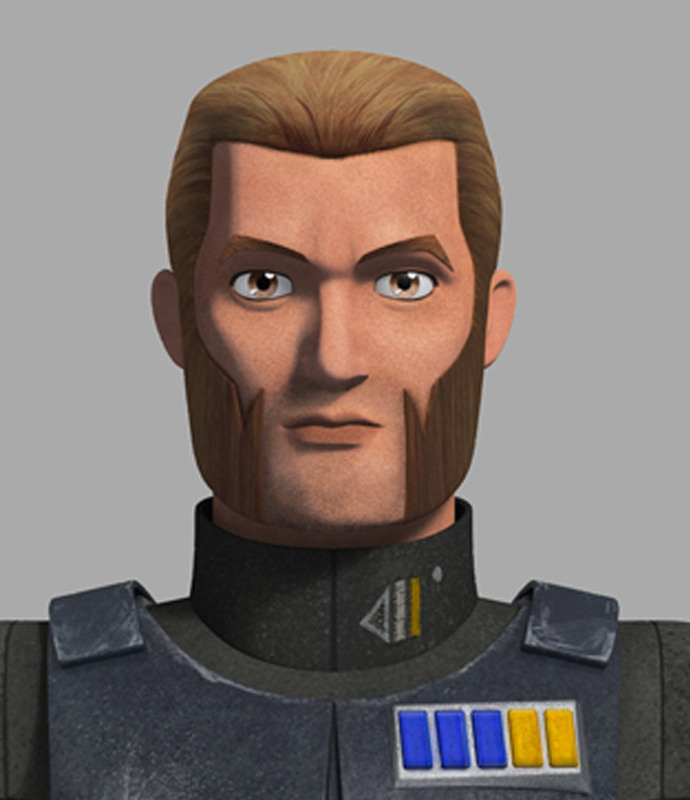 Who could forget #HotKallus? 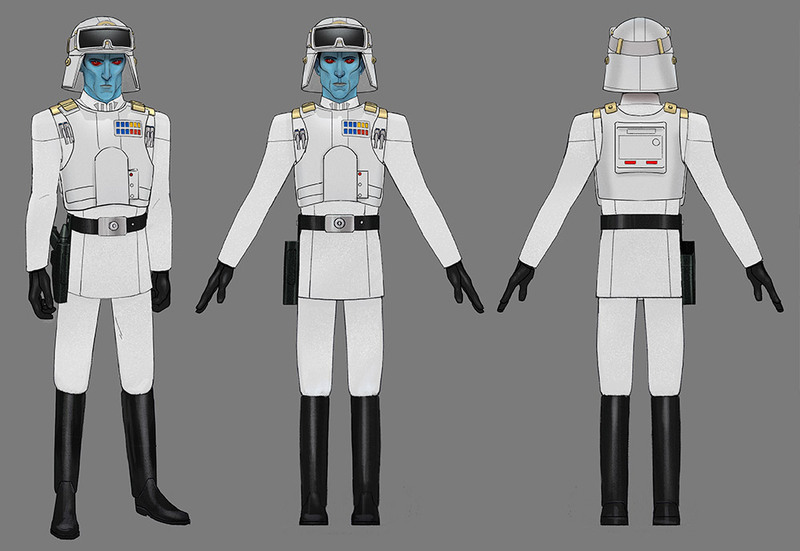 The dashing agent from the Imperial Security Bureau defected from the Empire to serve the rebellion by the end of the series, and his buttoned-up look got a little more relaxed along with his all-new wardrobe. 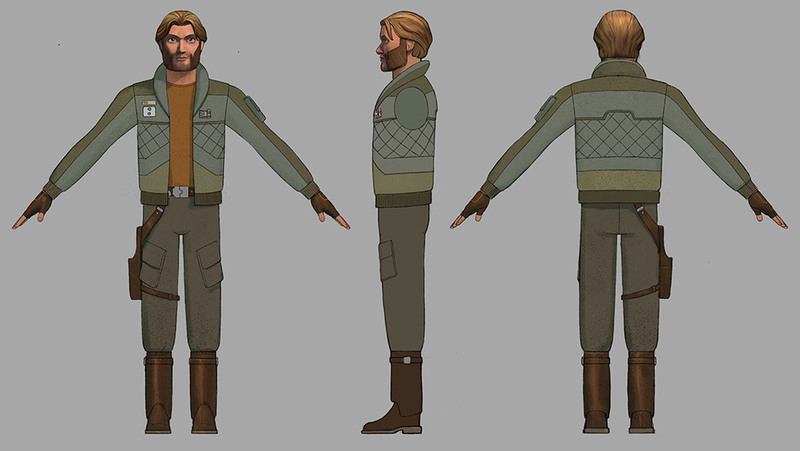 Like some of the quilting seen more recently in Star Wars Resistance, details of his jacket hark back to the bundled-up rebels serving on Hoth. “The jacket is intended to evoke the Echo Base look with its padded collar and quilting,” Plunkett says. When we last saw the fearless Mandalorian warrior, she had a new deep purple pixie cut and shoulder armor that depicted the majestic purrgil blasting into hyperspace. Sabine’s armor calls for standard Mandalorian construction, similar to any Fett outfit or earlier Sabine look you might already have in your cosplay closet. 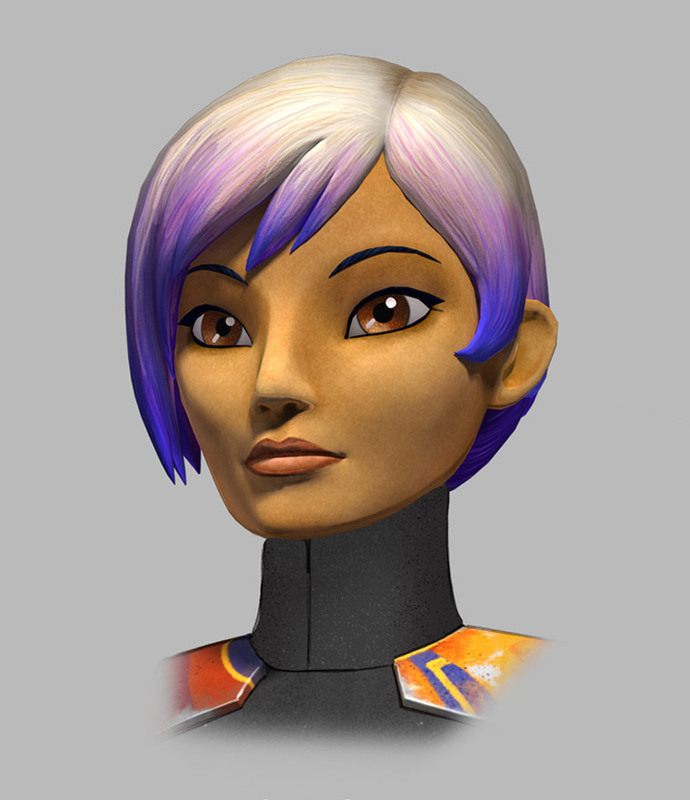 “The challenge with Sabine is probably going to be the elaborate paint scheme,” says Plunkett. 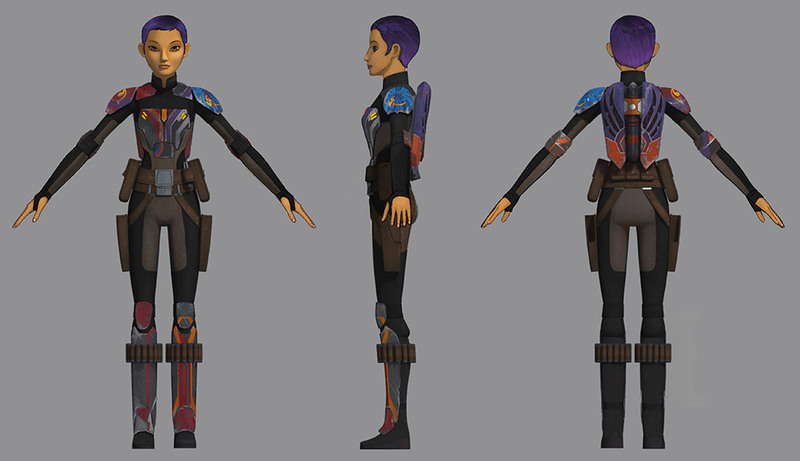 But of all of Sabine’s various armor decos, her last look may be the easiest to emulate. 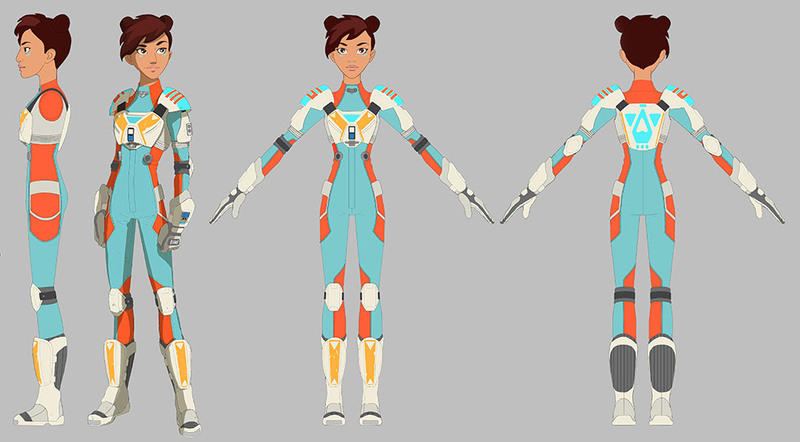 “This one has the most geometric shapes across the armor, so making stencils for the kneepads and other parts should be a little simpler than her other iterations,” Plunkett says. 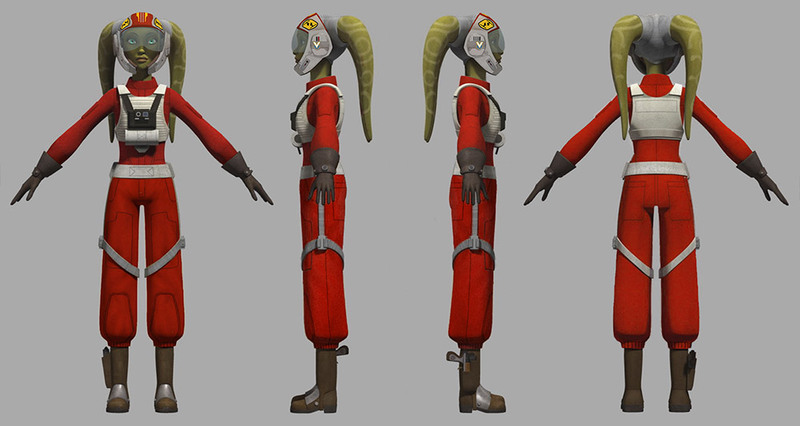 Check back for more Cosplay Command Center as we explore detailed images of characters from Star Wars: The Clone Wars ahead of Star Wars Celebration Chicago! My daughter was 4 years old when she saw the Star Wars films for the first time. I jumped at the chance to take her to see A New Hope on the big screen, which is how it was meant to be seen. And watching an original 35mm print in a darkened theater surrounded by several hundred other fans was enough to make me feel 4 years old again, too. Soon enough, she could narrate the entire original trilogy. She played with my vast collection of toys, and she discovered her own newer action figures. She listened to the NPR dramatization on an endless loop. She dueled with Darth Vader at Walt Disney World. When my son came along, his first contact was also with the original trilogy, but at home on a Blu-ray version. He was also immediately captivated. Everyone has their own unique journey to discovering Star Wars. The galaxy and the franchise have become so massive that there are countless points of entry. But there is always an entryway — a point of first contact, if you will. For many people, it’s one of the films. For others, it might be one of the animated series, a book, or a comic. Whatever it is, when you sit down to watch or read a story set in that galaxy far, far away, something in it resonates. Something clicks. Something grabs ahold of your imagination and won’t let go. Suddenly, you’re a Star Wars fan. Fans of a certain age (i.e., those of us who are first-generation fans) discovered the original trilogy at the beginning. Our journey involved darkened theaters, shocking revelations of parenthood by Darth Vader, Kenner toys, and goofy picture books. Brilliant. A second generation of fans came of age when the prequel trilogy took the country by storm. For many of them, The Phantom Menace was their first exposure and how they discovered Star Wars. Their entryway was populated by young Anakin, Padmé, Darth Sidious, and more Jedi than you could shake a stick at. Wonderful. Today, another generation is discovering and growing up with Star Wars through the sequel trilogy and beyond. There have never been more points of entry. And many of the fans who made up those previous generations now have kids of our own — and we’re bringing them along with us for the ride. Nevertheless, one thing remains true: Every fan has his or her own unique journey to discovering Star Wars, even with an established fan acting as a guide and teacher. Today, the characters and stories that we grew up with are not only still popular, but also very much alive and actively growing. Our kids grow up on a steady diet of Star Wars books, toys, lunchboxes, and games. And in many cases they have all of these things, and an understanding of key characters, before they even see the movies. My children have found their way through the galaxy together. The films played a huge role in that, sure, but they also forged their own path through Star Wars Rebels, LEGO Star Wars, the Origami Yoda books, Forces of Destiny, and on and on and on. Their journey to becoming fans has been so different from my own. And I love that. I love that we all have different experiences and find different things to love. I love that Star Wars continues to tell stories for all types of fans of all ages. Being a parent is a constant balancing act. We want to share the things we love, but we also want our kids to come to the story in their own way, on their own terms, and seen through their own eyes. Hopefully, our kids will care enough about the story to make sure their own children discover it (in ways we can’t even imagine). My kids love Star Wars because of their own experiences with it. They have their own favorite characters and scenes, and there are stories that speak directly to them. And that’s that’s how it should be. There are so many ways to discover and experience the saga. It doesn’t really matter if you start with The Phantom Menace or A New Hope, The Force Awakens or Galaxy of Adventures, Star Wars Rebels or Star Wars Resistance. And it doesn’t really matter where you go from there. 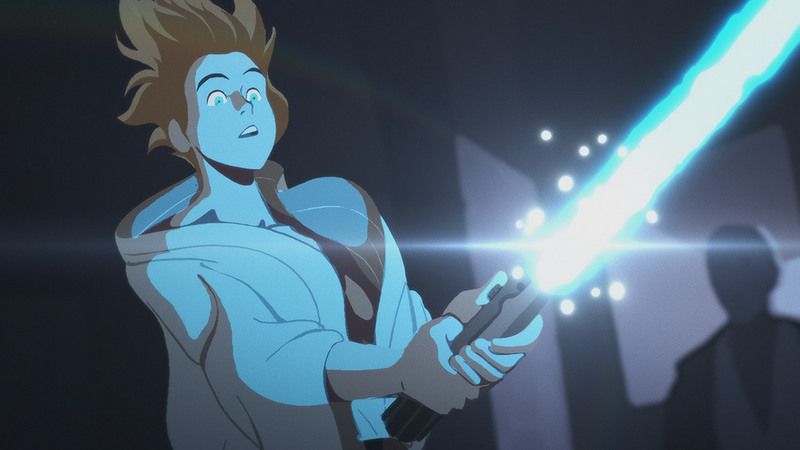 For more on Galaxy of Adventures, visit Star Wars Kids on YouTube, StarWarsKids.com, and StarWars.com. Jamie is a publishing/book nerd who makes a living by wrangling words together into some sense of coherence. He’s also a contributor to GeekDad and runs The Roarbots, where he focuses on awesome geeky stuff that happens to be kid-friendly. On top of that, he cohosts The Great Big Beautiful Podcast, which celebrates geek culture by talking to people who create it. With two little ones and a vast Star Wars collection at home, he’s done the unthinkable: allowed them full access to most of his treasure from the past 30 years, opening and playing with whatever they want (pre-1983 items excluded). 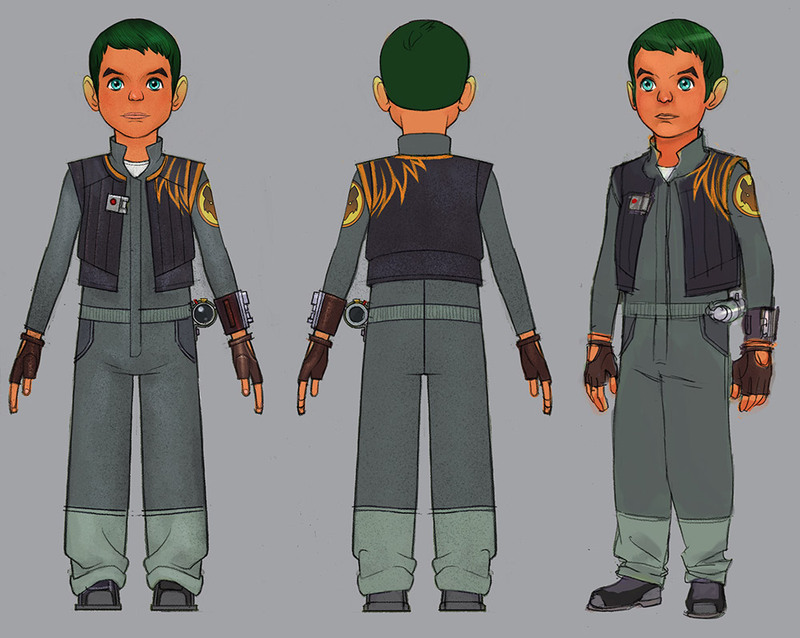 When Kazuda Xiono joined the Resistance as a pilot and a spy last year, we discovered a whole new cast of colorful characters inhabiting the Colossus platform on the edge of the Outer Rim. 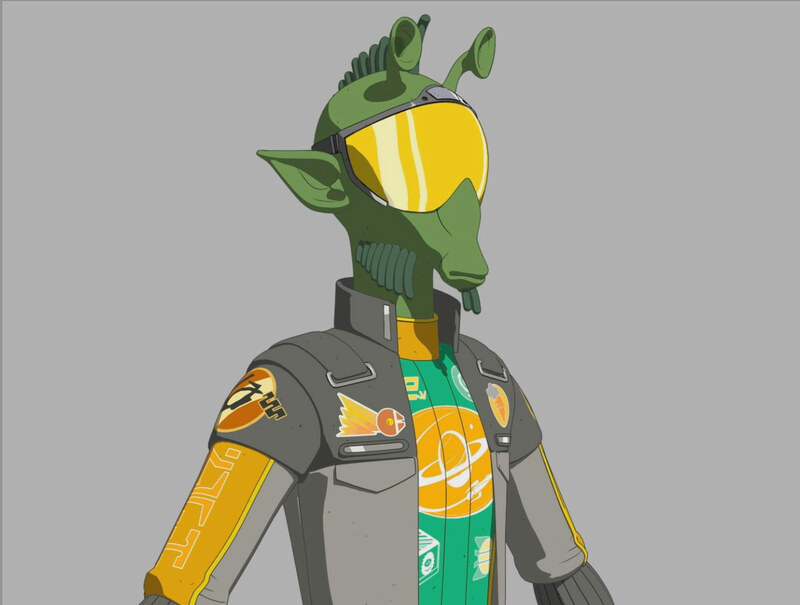 This April, fans will have their first chance to cosplay Kaz, the Aces, and other characters from the hit new animated show at a Star Wars Celebration. So we asked Art Director Amy Beth Christenson to share her insights and tips on bringing these costumes to life. Christenson and the design team looked to real-world inspirations – from police riot gear and firefighter garb to space suits and uniforms worn by NASCAR, Formula 1, and Motocross racers – to create unique new uniforms and accessories. “There’s two ways to approach any of these characters,” Christenson says. “If you’re trying to do something that looks like it jumped out of the show,” especially vibrant colors will help you emulate the stylized anime-inspired feel. “If people are going to go more for what is the real-world version, I’d probably dull down the colors, honestly,” she adds. 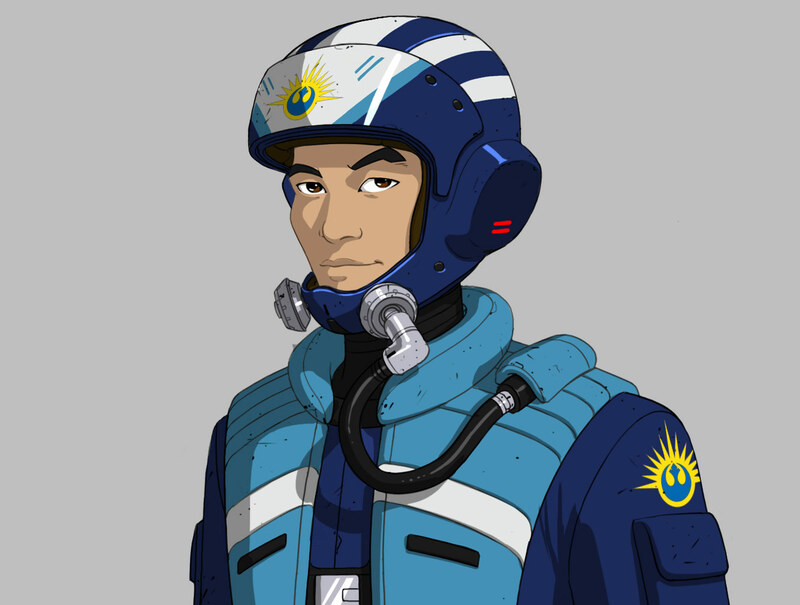 When we first see Kaz, he’s a hot-shot pilot with the New Republic Navy being pursued in his X-wing by Major Vonreg’s crimson TIE interceptor. 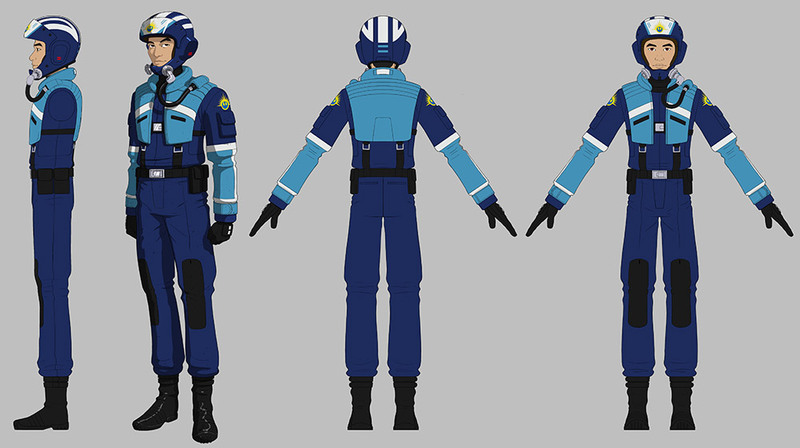 Speaking of Major Vonreg, his unique uniform will be an eye-catching piece roaming the Celebration exhibition floor. Always ready to get to work, Tam’s accessories include a pair of goggles, “fairly simple, but getting the rounded shapes would be key,” Christenson says, and gloves. “Her work gloves could be heavy duck cloth or possibly even leather, like welding gloves, but note that there is a ribbed cuff on the inside of the glove,” she adds. Much like Torra, building Freya’s ensemble calls for stretchy material similar to the kind favored by snowboarders. Think ski pants with plenty of warmth and stretch. “The quilting would be pretty pronounced on the hips, forearms, and knees,” adds Christenson, with red piping snaking around panels. 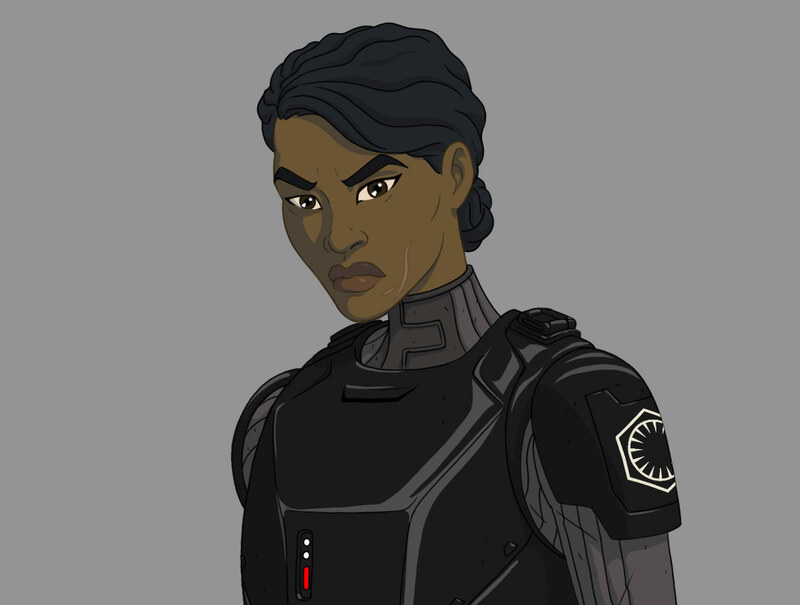 By the time we get to Chicago, fans will have been more formally introduced to Tierny, a First Order security agent first glimpsed in the mid-season trailer. But in the grand tradition of Star Wars cosplayers, if you want to build your own Tierny cosplay early, Christenson has some pointers. The ensemble is tricky because it’s comprised of unique elements. 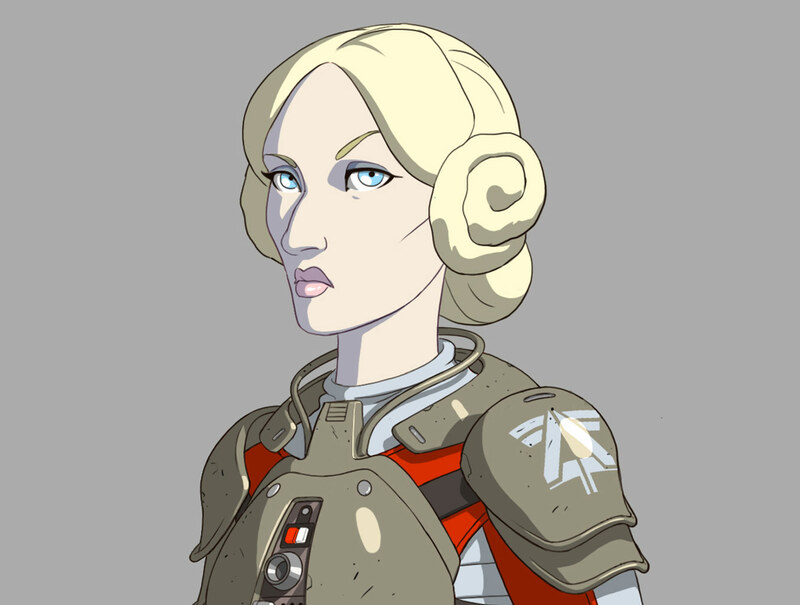 “She’s a security agent like Kallus, and they get to design their own gear. They don’t really have the standard uniform, so her entire under suit is very police/SWAT team inspired,” she says. 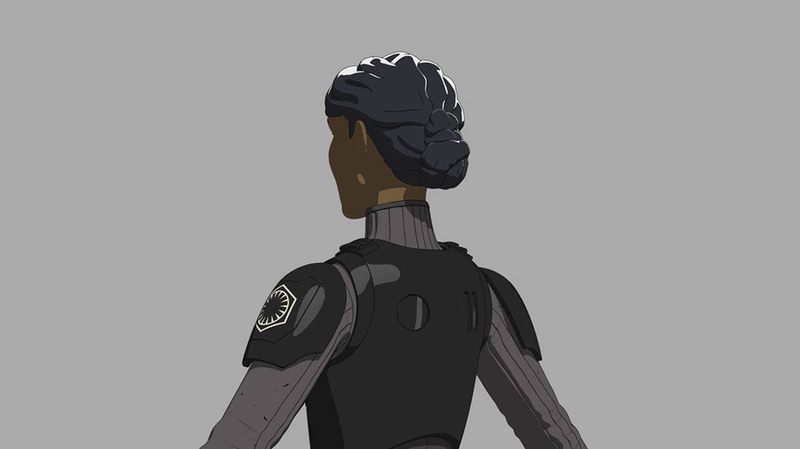 But her shoulder armor could be repainted from a standard First Order trooper’s kit, Christenson notes, and the code cylinders on her belt are standard First Order-issued. Real-world police riot gear, military sweaters, and Navy SEAL garments helped inspire the look. “In SEAL team training garments, you’ll see a lot of the same knee padding and especially the ribbing on the shirt,” she says. Check back for more Cosplay Command Center as we explore detailed images of characters from Star Wars Rebels and Star Wars: The Clone Wars ahead of Star Wars Celebration Chicago! There is only one event where you can find General Grievous hanging out with General Leia, see a Sith Disney princess twirling a red lightsaber, or meet Chewie’s Angels, a trio of pastel-colored Wookiees. Star Wars Celebration is truly the ultimate fan experience where anything is possible — new friends are made, old friends catch up, and you can meet your childhood heroes. 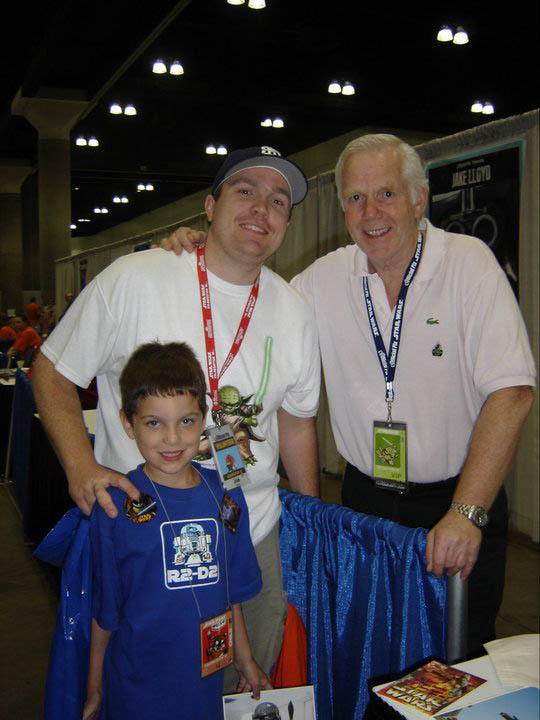 In fact, you might meet several different versions of your favorite Star Wars hero. There is only one Mark Hamill, but at Star Wars Celebration you can see countless Luke Skywalkers roaming the halls. Cosplayers add so much joy and whimsy to the Celebration experience. If you’re thinking about giving cosplay a try for Star Wars Celebration Chicago, here are a few tips to help you get ready! 1. Fabric or cardboard? Now that you’ve decided you want to cosplay, it’s time to figure out your costume and the first question you must ask yourself is, “Do I want to wear clothes or cardboard?” If you’ve always wanted to craft an AT-ST that you can walk around in, Star Wars Celebration is the place to do it! Just know that the more elaborate the costume, the more limited you might be in terms of getting around the convention floor. As someone who has cosplayed as the Millennium Falcon, I can tell you that it wasn’t easy navigating through Artist Alley while wearing a very wide foam starship. Another thing to keep in mind when selecting your costume is your comfort level. 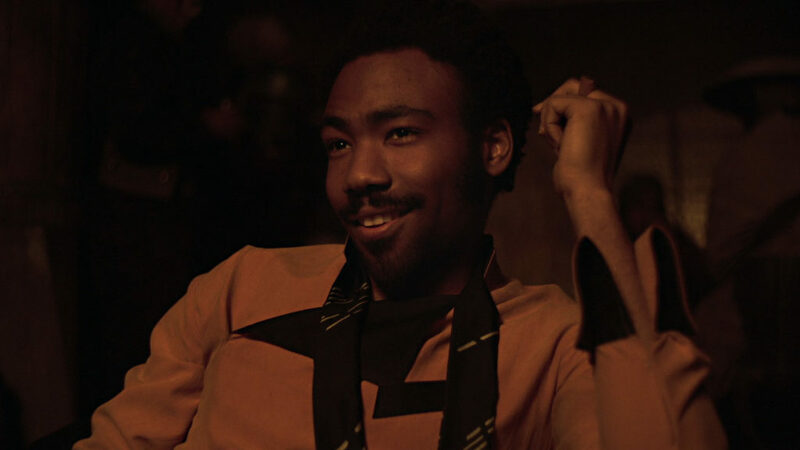 Dressing up as Rey or Lando Calrissian will probably be much more comfortable than cosplaying as Queen Amidala or Chi Eekway Papanoida. An elaborate outfit will make a statement, but you may not be able to sit in it, which will limit your time in the costume. Also, if you’re traveling and the costume is oversized or delicate, you may want to carry it on the plane or ship it to your hotel ahead of time. Time is probably the biggest factor in deciding what to wear. But even if you’re short on time and money, there are plenty of costumes you can whip up on a budget and with only a week to work on it. Having limited resources can often lead to unique and unexpected costumes! 2. Make a costume emergency kit. It is inevitable that something will go wrong with your costume, even if it’s store bought. A zipper may break, a Styrofoam eye may fall off, or the glue may not hold. If you’re traveling to Chicago from out of town, be sure to pack a costume emergency kit. Some kit essentials to consider: safety pins, double sided tape, hot glue or super glue, and any other odds and ends that you might anticipate falling off your costume. (I’m looking at you, feathers.) You may not end up needing the kit, but in the case of a cape crisis, you’ll be prepared! 3. Get ready to get into character. If this is your first time cosplaying, prepare to strike a pose. As you walk around the convention center in costume, people may stop and ask to take your photo. It might feel weird at first, especially if you’re dressed as a Star Wars villain, but posing in character makes for a great photo! And it’s amazing how putting on a costume can change how you stand, act, or speak; you might find that getting into character comes naturally once you start walking in that character’s shoes. 4. Remember, even Kylo Ren gets hangry. It’s surprising how quickly time goes by when you’re having fun at Celebration. And when you’re dressed in costume, taking photos, and chatting with friends, you may look at the clock and suddenly realize you forgot to eat lunch. 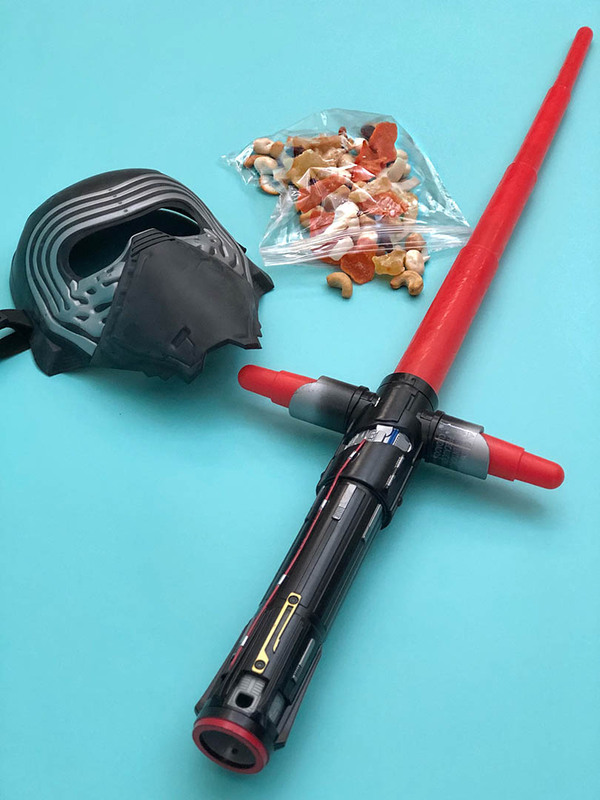 Make time for snack breaks and tuck a protein bar into your Han Solo holster or some trail mix in your Ewok pouch so you’re prepared for wherever the day takes you. 5. Troop with a friend. What’s better than one cardboard stormtrooper? Two, of course! Cosplaying with friends is sure to be a great time, but even if your friend doesn’t feel like dressing up, they may be able to offer a helping hand as you’re waddling around in your homemade Gonk droid costume. If your costume makes it difficult to see or restricts your movement, you will absolutely need a buddy to help you navigate the convention hall, lead you to the water fountain, and remind you about the panel schedule. Twitter @JenniferLanda and for more Star Wars DIYs, visit her YouTube channel. Luke Skywalker could feel the conflict within Darth Vader, but Emperor Palpatine hoped that instead of saving his father, the two would become bitter rivals. 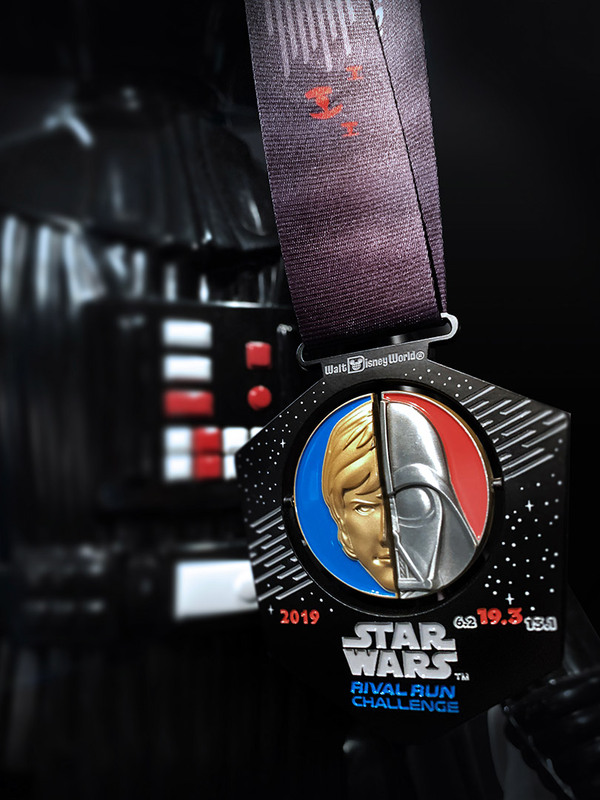 In April, runDisney celebrates the competitive spirit of these and other Star Wars characters at the Star Wars Rival Run Weekend at Walt Disney World Resort in Orlando, Florida, when you can challenge yourself or a friend to go the distance and snag one (or more!) of the covetable finisher medals. Today, StarWars.com has your first look at these finely-crafted depictions of some of the most enduring rivalries across the Star Wars saga! 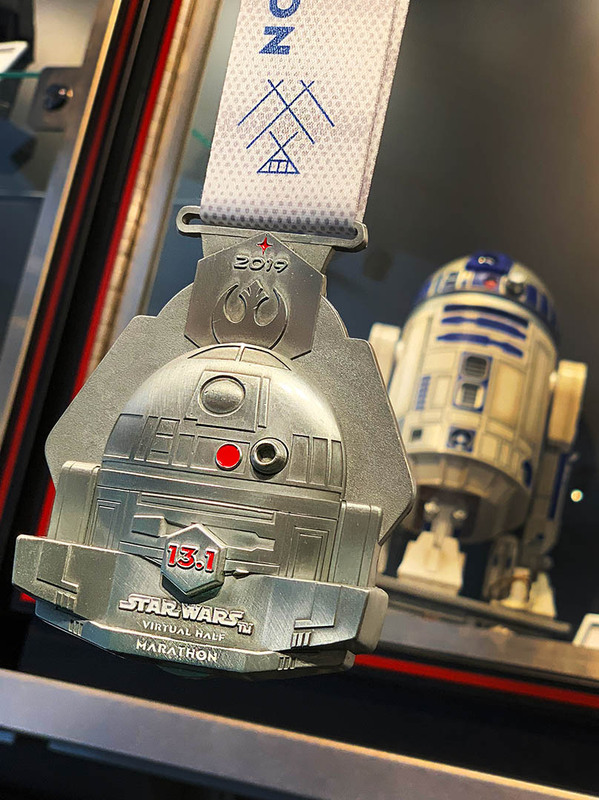 Whether you line the streets to cheer on your fellow fans, tackle your first 5K, or plan to crush the half marathon like an Imperial going after the Rebellion, we’re excited to see you there! 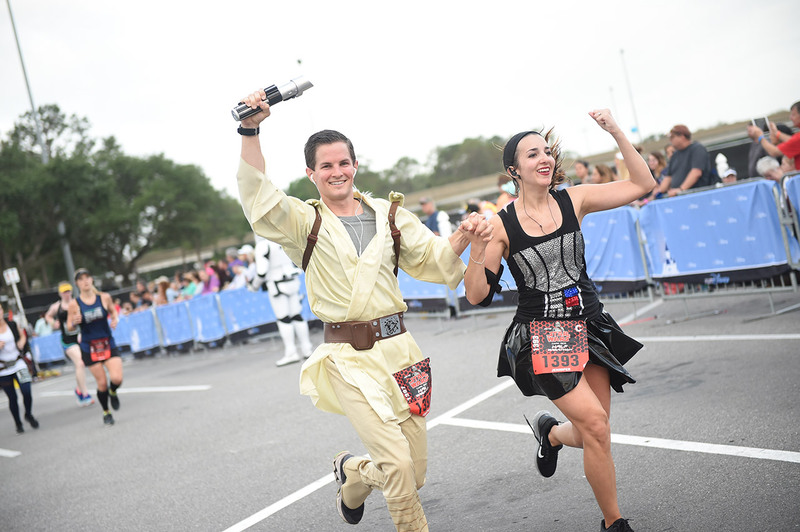 Meet Star Wars characters, enjoy music and entertainment before and after the race and along the course route, and dress up as your favorite characters! 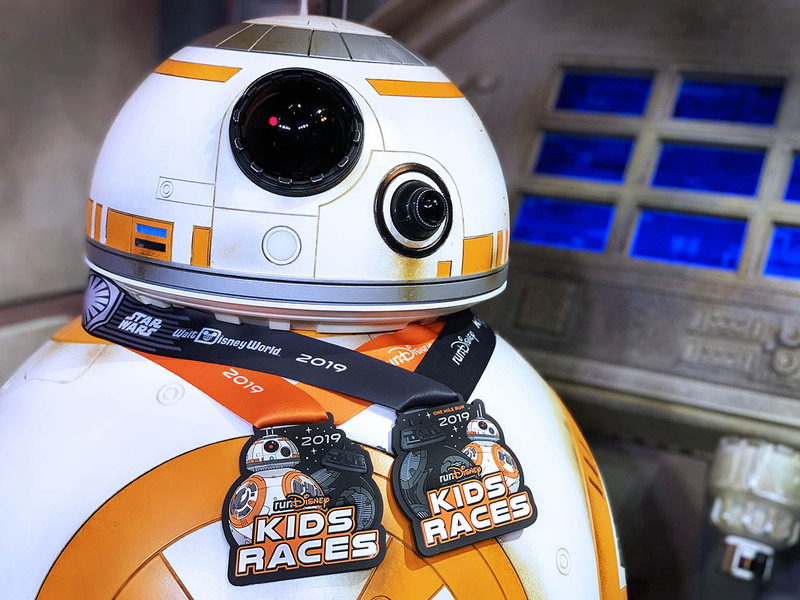 The races are designed for runners of all ages, experience, and abilities, including a mile-long race just for younglings. 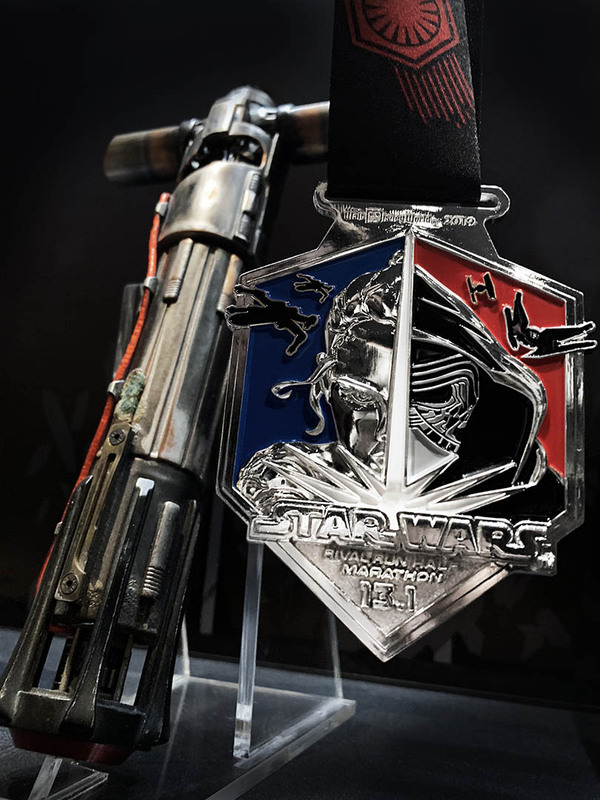 Race participants can collect these Star Wars-themed finisher medals and other commemorative merchandise throughout the weekend. It’s a new year and a new you, so fuel your Force and join the fun. 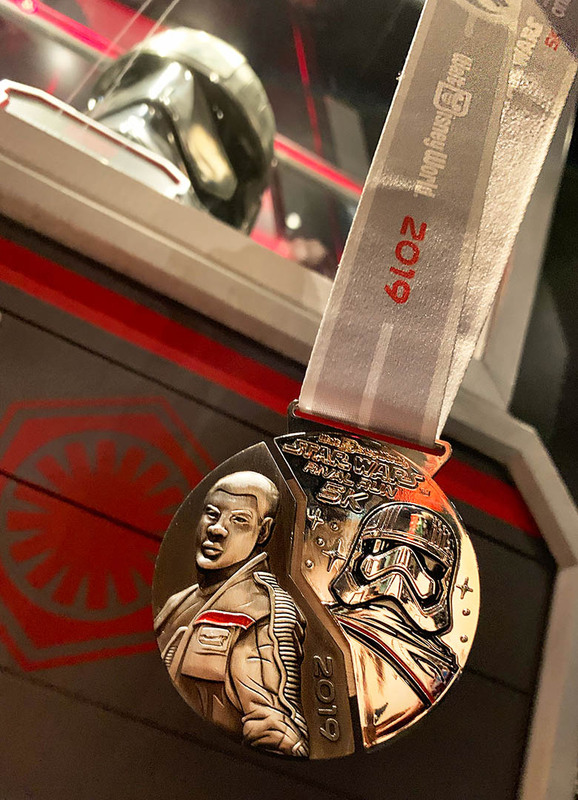 Star Wars Rival Run Weekend is coming to Walt Disney World Resort, April 4-7, 2019! Visit runDisney.com for more information, and be sure to register to get your hands on your own finisher medals. StarWars.com and The Star Wars Show are pleased to announce the winners of the Star Wars Fan Awards 2018! We received thousands of entries across four genres — Long Video, Short Video, Visual Art, and Photo — and were continually amazed at the incredible talent on display. Thank you and Wookiee hugs to all who participated! Check out the most impressive winners below, including recipients of the Filmmaker Select chosen by Dave Filoni, and Audience Choice awards voted by fans on StarWars.com! And learn more about how these passion projects were made in exclusive interviews with many of this year’s esteemed award winners. 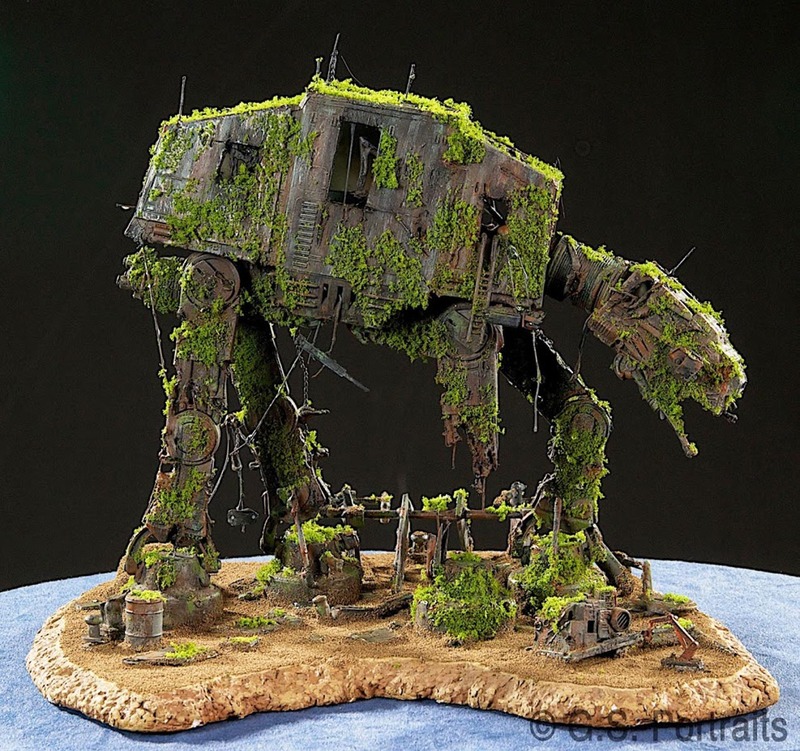 More Machine Than Man by Mark G.
How did you become a Star Wars fan? 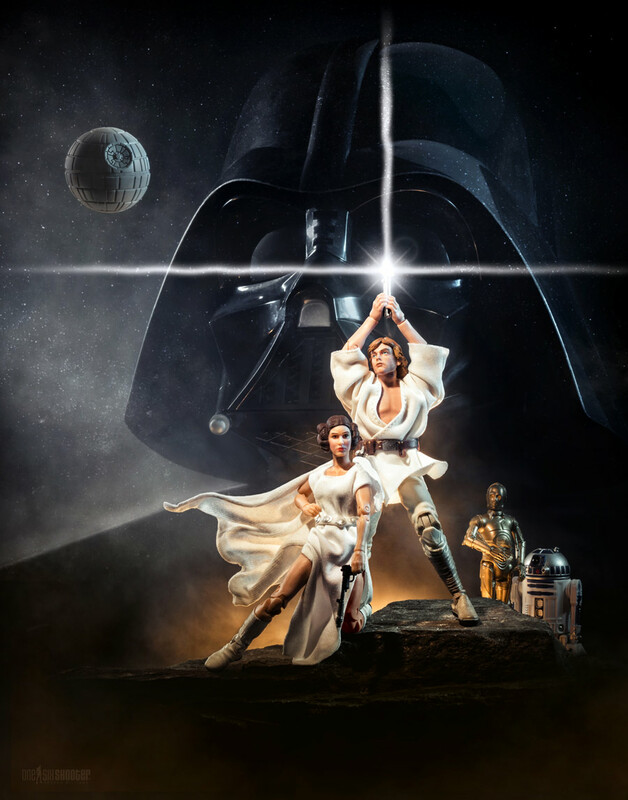 I saw Star Wars for the first time when it was originally in theaters in 1977. I was 11 years old. I’ve been all-in ever since. I remember seeing Return of the Jedi at the Thursday midnight special premiere screening where the ticket cost an outlandish $4.50. Star Wars was probably my primary inspiration for becoming a filmmaker myself. I learned everything I could about George Lucas, and even went to film school at USC on his example. I still maintain that original Star Wars is one of the greatest films of all time, in the same realm as Citizen Kane or Casablanca. What was the inspiration for your Star Wars Fan Awards entry, and how was the experience making it? I’ve had the idea for More Machine Than Man for years. Ever since we saw Obi-Wan Kenobi cut up Anakin and leave his roasting body for dead on that lava planet in Revenge of the Sith, we’ve known the REAL story behind all the things he told Luke about his father. Back in 1983, when Obi-Wan said Vader was “more machine now than man, twisted and evil” we never thought much about it. But seeing him dismembered, we now knew he had, among other things, robot arms and legs. He was LITERALLY more machine than man. And I though it was kind of cool that when making the original films, George Lucas must have had all that detail thought out that the casual viewer wouldn’t even think about. I made my own Obi-Wan Kenobi costume from dyed curtain lining material. We shot on a green screen, and then I built a miniature set, about 2 feet by 2 feet to shoot for the backgrounds. I lit the model, blew in canned smoke, and photographed it on my kitchen table. The R2-D2 is the voice activated 13” R2 that I’ve had for years. The X-wing I bought off of eBay, and then dry-brushed it to weather the parts that would be visible. All the elements were shot separately and sandwiched together for the final shots. The most challenging effect was the Jedi ghost effect, which I made in Apple Motion. It needed to make me transparent and blue, but also glowing and sparkling around the edges. I’m pretty pleased with how it turned out. It is a great honor to win the Best Comedy as well as the Filmmaker Select Award. Star Wars has been an important part of my life for over 40 years. It’s what made me want to be a filmmaker in the first place. And I’m delighted that people with an actual connection to the franchise are seeing and appreciating my work. Thank you so much. 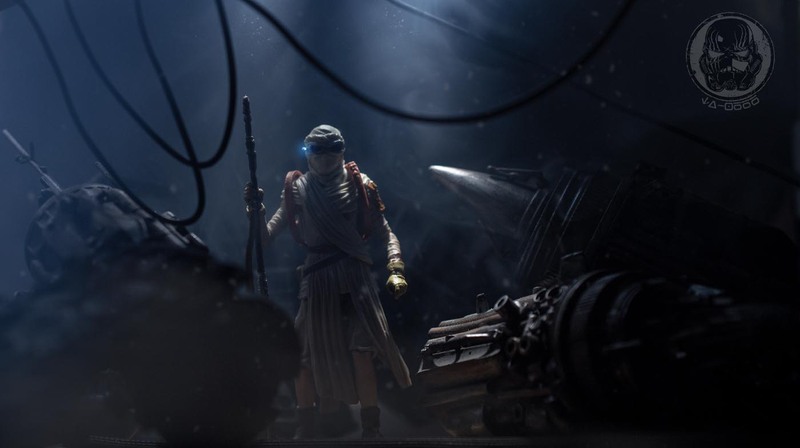 Like My Father Before Me: A Star Wars Story by Jack C.
The Kessel Run by Brian W.
I saw Star Wars as a child when it first released in theaters. The very moment the Star Destroyer appears in the opening shot of A New Hope, I was hooked. At that time, science fiction movies were very cheesy with everyone wearing aluminum foil costumes. Star Wars was the first genre movie that felt like it took place in a real universe. I wanted to do something with Star Wars characters that had not been overdone already. This is very difficult because there are already so many excellent Star Wars fan films out there. I wondered what characters had not had their own film yet, and I realized the dejarik pieces from the Millennium Falcon’s holochess board had never been given their due. I also thought they would be very fun to animate. It was, but I did not think about the fact that in most shots I would have to animate eight characters at once. It was a tremendous amount of work and I almost gave up several times, but the end result was worth it. I am thrilled to win. There are a large number of excellent Star Wars fan films out there, some made by Hollywood professionals with high-end equipment. To stand out among the crowd is a great feeling of validation both as an animator and a Star Wars fan. Exile: A Star Wars Fan Film by Noel B. Star Wars: The Toys Awaken by Raymond M.
I was born in 1974 and grew up with the original trilogy being a huge part of my formative years. Watching The Empire Strikes Back in the theater in 1980, and taking in Yoda’s wisdom and Vader’s galaxy-shattering revelation, made a lasting impression on me. I was hooked at that point and have been a lifelong fan since ever since. I didn’t realize it then, but my Star Wars fan creativity was in its beginning stages just after Return of the Jedi came out in theaters in 1983. I wrote two short stories complete with illustrations, naturally titled The Jedi Strike Back and Return of the Empire. I don’t think they were very good, but I was so proud to share them with my family. The inspiration for my film goes back to 2012 when Disney announced it would purchase Lucasfilm and start making new Star Wars movies. After living for years with the reality that there would be no more Star Wars movies after Revenge of the Sith, this news re-ignited the fan in me. Being anxious for any and all Star Wars news, I checked StarWars.com daily and read that Lucasfilm would resurrect the Star Wars Fan Film Awards and present awards at Star Wars Celebration Anaheim in April 2015. I always had an interest in video production and had just switched careers from electrical engineering to running a freelance business in motion graphics and visual effects. I knew the Fan Film Awards would be the perfect opportunity to produce my first short film, share my fandom with the world, and actively participate in Star Wars Celebration (for which I already purchased a four-day pass). Because my excitement for Star Wars was at an all-time high, I wanted to produce a fan film about a fan whose toys come to life to help him out of a jam. I was fortunate enough to have my first fan film, Star Wars: A Toy Story, selected as a finalist and nominated for Best Visual Effects. I was honored to be a finalist in 2015, but failing to win one of the coveted awards left me feeling incomplete. Falling short drove me to produce a film for the 2016 Star Wars Fan Film Awards. 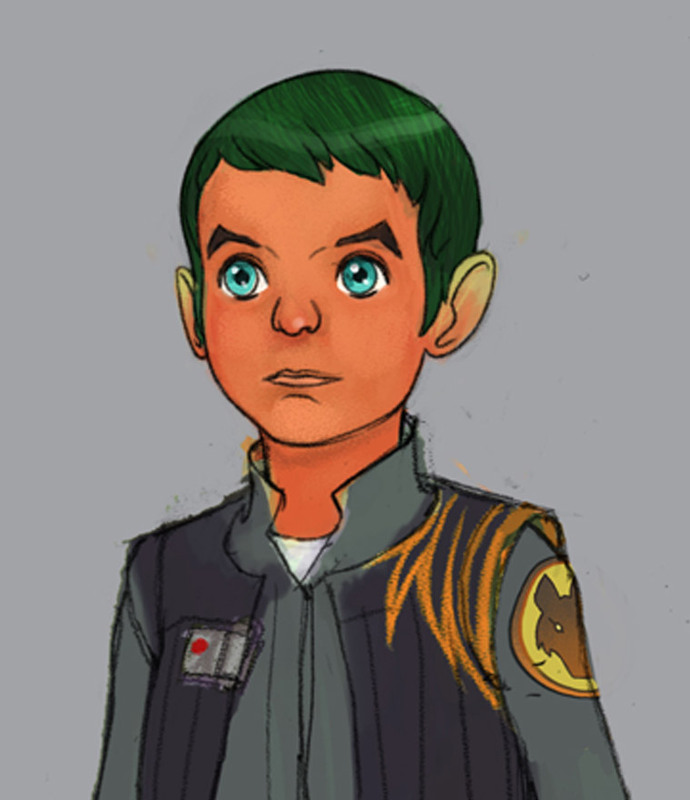 I wrote the script for Star Wars: The Toys Awaken in early 2016 and kicked off production in April. Ultimately the scope of the film was too wide, and I didn’t have enough time to complete the film before the deadline. I put it on hold and switched gears when I learned of Lucasfilm’s #GoRogue fan film contest leading up to the release of Rogue One: A Star Wars Story. I managed to complete a 2-minute film for the contest, The Rogue One: A Star Wars Toy Story, but unfortunately I fell short of winning once again. Lucasfilm did not hold the Star Wars Fan Film Awards in 2017, but I eventually came back to The Toys Awaken late in 2017. I had gotten so many great people involved in my initial production effort (about 40 people for the movie theater scene from local fan groups Star Wars Steampunk Universe, San Diego Star Wars Society, and Science Fiction Coalition), I felt a responsibility to complete the film even in the absence of a Lucsafilm contest. By early 2018 I had completed a significant portion of the stop-motion animation. I had to put it on hold once again due to work commitments. But then this past summer I learned that Lucasfilm would hold the 2018 Star Wars Fan Awards. That announcement provided me the impetus to make the final push to complete the film. The story is set on the opening day of Star Wars: The Force Awakens and tells the story of a young Star Wars fan whose toys come to life. The young fan, Riley, is played by my daughters Maliya and Nora, who are two and a half years apart in age. For the shots we filmed in April 2016, Maliya played the role of Riley. By the time we got around to completing production two and a half years later, she was too old for the role, so I had Nora, who was the right age, step in and complete the shots. I shot Nora so that we never see her face directly, and I only shot extreme close-ups of Maliya’s eyes when we needed shots of her face. The timing worked out perfectly. I’m so happy that it took three years to complete the film so that both Maliya and Nora could play significant roles in it. I’m ecstatic that we won two awards, but I’m even happier that this film has provided us with a very personal family experience that we’ll never forget. Winning means everything to me. Having Lucasfilm officially recognize my work as a Star Wars fan is a tremendous honor. Having entered three Lucasfilm contests, I have seen how high the bar is, how talented the competition is, and how rare winning is. Being a finalist in 2015 and not winning, and having made three fan films to get to this point is extremely satisfying. It means even more to me that my daughters have been a part of this journey. I hope they see this as a life lesson that hard work and sticking with their passions can lead to positive outcomes even though the journey can be difficult. Ice Cream To Go by Jordan G. and Cody G.
Vader: Misquoted by Jared H.
Grievous Versus Praetorians by Brian W.
Simple Tricks and Nonsense by Jason Y. Star Wars has always been around in my life for as long as I can remember. My earliest memories consist of my family and I sitting around the TV watching the original trilogy together on VHS. My brother and I enjoyed scrapping together costumes from random items around the house and reenacting scenes from the films. We would spend countless hours playing with Star Wars action figures, and even made a few of our own fan videos with them. As I was thinking about my entry for the Star Wars Fan Awards, I really wanted to capture the essence of my love and appreciation for Star Wars. Growing up, I loved collecting and playing with the toys available at the time. My love for collecting Star Wars toys continues today, which I get to share with my three children, who have become avid Star Wars fans in their own right. For my entry I created a short video inspired by the original Kenner action figure TV commercials, but used modern action figures from the Black Series line that we collect together as a family. Needless to say, we had such a fun time creating the video together! As a Star Wars fan, it is an incredible honor to be among this year’s winners of the Star Wars Fan Awards — I’m proud to represent the greatest fandom in the galaxy. Thank you for your votes and support, and as always, may the Force be with you! A Close Call by Jared P.
A (Tiny) New Hope by Trevor W.
I saw Star Wars the day it opened at a drive-in on my birthday (May 25th!) and as soon as Darth Vader walked through the door of the Tantive IV…I was hooked! I collected everything I could get my hands on and afford or I begged my parents for it. Action figures were, of course, always a part of that collection. I’m a toy photographer on a semi-professional and hobby basis and try to do a big, iconic Star Wars shot every year. This year, I got my hands on the Hasbro full-size Vader helmet and it looked perfectly scaled to use with 6″ and 3.75″ figures to recreate the iconic Star Wars poster. I had to “redesign” (cut up and add pieces to) Leia’s dress to match the one in the illustration. Lighting and getting the fog just right probably took 150+ shots! Having it work as well as it did was worth all the effort though. My work has been recognized before, but this is a BIG DEAL! Being recognized officially by the people at StarWars.com and Lucasfilm/Disney is a fan artist’s dream come true! Honestly, I can’t remember a time when I wasn’t a Star Wars fan. My older brother was already really into it by the time I was old enough to become interested in the films, so I grew up watching both the original trilogy and the prequels. In fact, my first Star Wars memory is crying because I wasn’t allowed to go see Attack of the Clones on its opening night. (I was only six at the time.) But when Revenge of the Sith came out three years later, I finally got to have the magical experience of seeing a Star Wars movie in theaters for the first time! For me, the Force has always been the most fascinating element of the Star Wars universe. Its portrayal in the Mortis arc of The Clone Wars is especially beautiful, complex, and thought-provoking. It raises just as many questions as it does answers about what balancing the Force means, and about what the Force actually is as an entity. I love how the Father, Son, and Daughter represent certain aspects of the Force, and I think that is also the case with certain characters in the saga films. That is why I chose Rey and Ben Solo/Kylo Ren as the two characters I wanted in this piece. 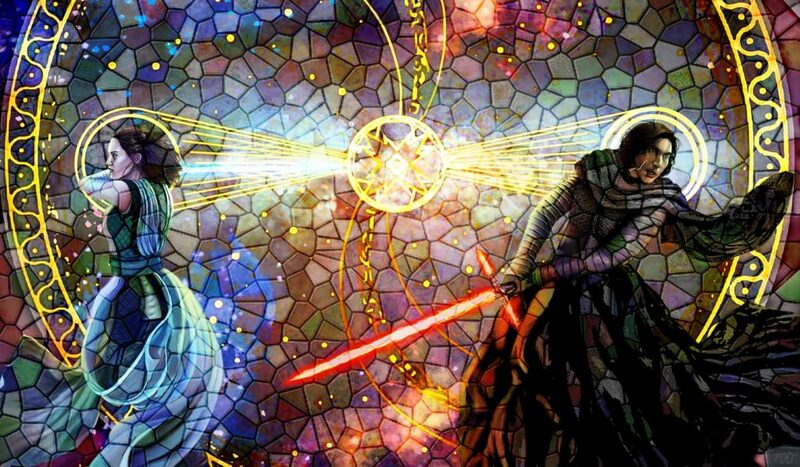 Light and dark, if you will. Creating the final design of the composition was a long and difficult process. I started with a lot of sketches, and after narrowing the options down to a single idea, I began the process of digitally painting it. That design then went through several major alterations and transformations along the way. The composition I ended up with is quite different than what I originally imagined, but I think that it is stronger because of its numerous iterations. This is definitely one of the more difficult pieces I’ve ever worked on, but it is also one of the most rewarding. To have my work recognized by fellow fans and by Lucasfilm’s panel of judges is an incredible honor for me. As an artist who is passionate about both my work and about Star Wars, seeing that people have responded so positively to the piece has been really wonderful. The sheer volume of support far surpassed what I ever could have expected, and I’m extremely grateful for and humbled by it. The Star Wars community truly is like a family, and I’ve never felt that more than during this process. Enfys Nest Costume by Michaela M.
I always kind of grew up watching Star Wars movies but I really got into it with The Clone Wars and Star Wars Rebels. It’s become a family event; we all cosplay as different Star Wars characters together. 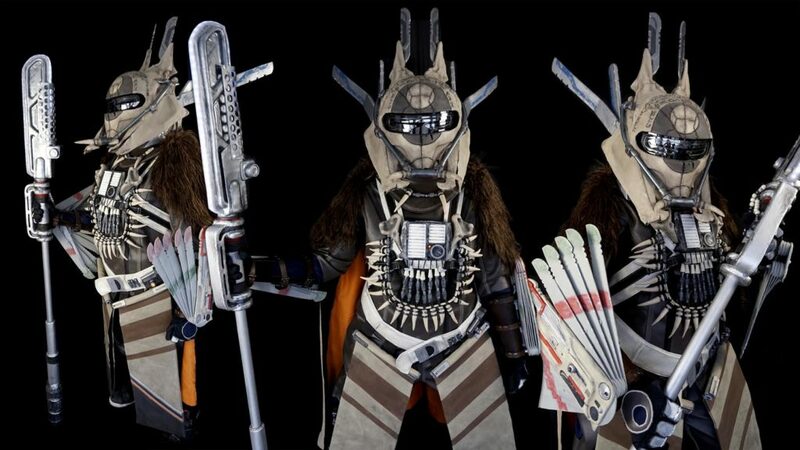 As soon as I saw the costume design for Enfys Nest I fell in love with it. Once I actually saw Solo, I knew I had to try making it. The entire costume was a nonstop, 10-week project. The helmet alone took five of those weeks. It was easily the most complicated project I’ve ever undertaken. I spent hours researching details of the costume, some of which could only be seen on action figures of the character. I tried to create a screen-accurate costume, right down to the scuff marks. 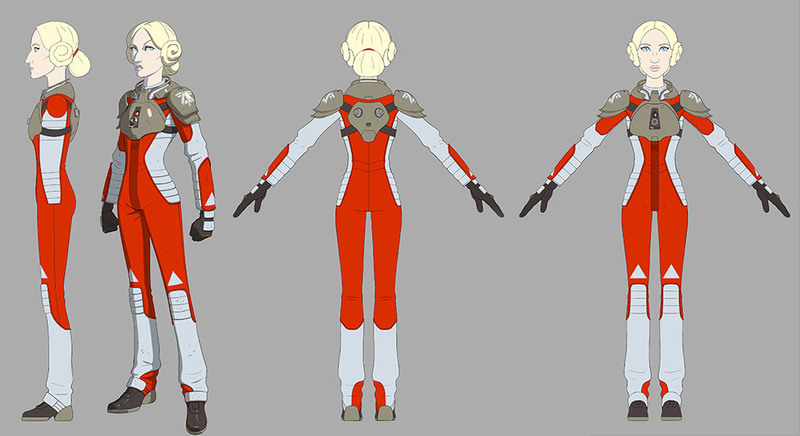 I also wanted to incorporate the working technology of the costume as much as possible. The electroripper staff, belt, and chest box all light up. 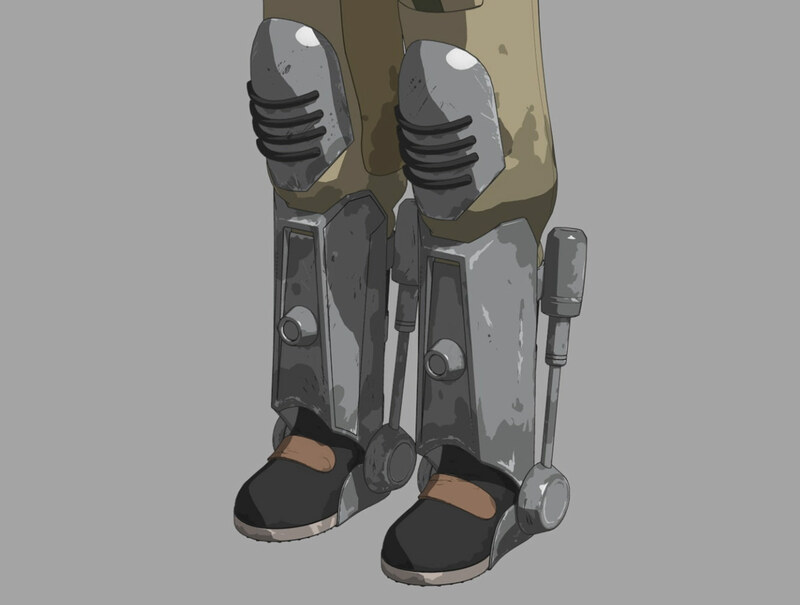 I also built the vambraces to open and close on my arms, as well as a working voice changer in the helmet. It’s an honor to have all my hard work be recognized by fans of the franchise. I originally created this costume as a personal project and a challenge to myself. The positive response has been overwhelming. Forgotten AT-AT by Mirko M.
Krayt Dragon Action Figure by Brad H.
It happened the moment my mom popped in the VHS of A New Hope. The gears of my young imagination were set in motion and there was no going back. Truly wonderful the mind of a child is. The skeleton of the krayt dragon in the desert of Tatooine in Episode IV always caught my eye. It was one of the many blink-and-you-miss-it moments that has me re-watching Star Wars to this day. Growing up, very much alive and ferocious krayt dragons showed up in several video games I played. In the MMO Star Wars Galaxies, krayt hunting was a community event. Groups of eight or more players banded together to take down the massive beasts and claim the loot on the other side of victory. Years after regularly playing Galaxies, I was learning digital sculpting and looking for a challenging project to give myself. I found a screenshot I took in-game during a krayt hunt, and the fond memories fueled this project to completion. Winning means a lot to me because I feel like I am contributing to the larger Star Wars community and getting to share my work on its biggest platform with people who will love the krayt dragon as much as I do. 切り絵：白と黒の共闘 (Kirie: Black and White Joined in Battle) by Yukiko K.
Forty years ago, when I was a little child, I saw Star Wars for the first time. 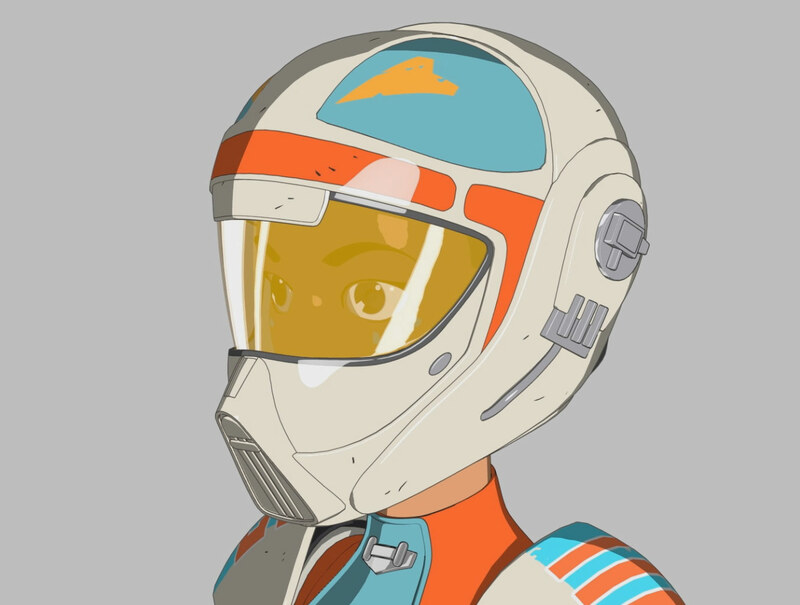 At that time, sci-fi animation was a fad in Japan, so I was interested in sci-fi. Space, robot, science, and future technology. I thought they were very cool! That’s why I was also interested in Star Wars. So I became a fan. I saw the scene where Rey and Kylo Ren fight together against a common enemy in The Last Jedi. I came up with the idea of expressing their “shape” of the Force with white and black feathers. My dream is for many people to know Japanese paper cutting art (called “Kirie”) and my Star Wars fan artwork. I was chosen as a winner, so more people will see my Kirie artwork. That’s a very happy thing for me, and I was chosen as a finalist for the Audience Choice award. I’m so happy! Darth Maul Drawing by Justin M.
Rey, BB-8, & Chewbacca on Jakku by Brianna E.
I don’t remember the exact moment because I grew up on Star Wars. Even my first celebrity crush as a kid was Harrison Ford. Star Wars has always been a classic to me, a series of movies you can watch over and over again, in different orders, and never tire of. 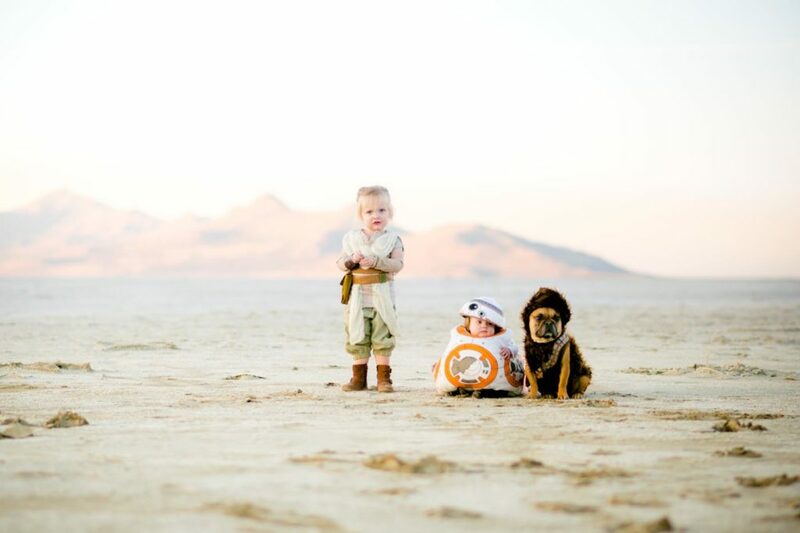 My children are my biggest inspiration, so combining the love for my children, my dog, photography, and Star Wars seemed like a no-brainer! Winning means so much to me! I’ve never won anything for any of my photography. And for my first two awards to be for one of my favorite pictures I’ve ever taken, it really warms my heart. Rex and Baby Rey Family Portrait by Isaiah T.
I have been a HUGE Star Wars fan for my entire life! For as long as I can remember. The original trilogy was basically playing all day long in my house. One of my favorite Star Wars memories was going to see the midnight showing of The Phantom Menace on opening night! I just remember sitting there, hearing the music and seeing the text crawl on the big screen for the first time! Gives me chills just thinking about it! Star Wars was a huge part of my childhood and remains a huge part of my life. It’s so awesome to be able to share my passion for it with my own children now! 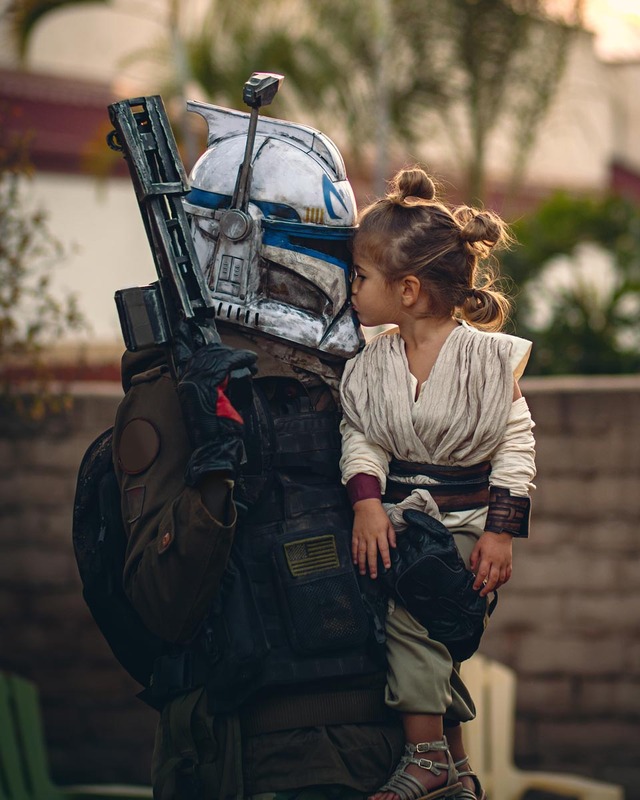 My entry for the Star Wars Fan Awards happens to be a shot taken on Halloween with my daughter and me. I was dressed as one of my favorite characters, Captain Rex. She was her most favorite, Rey. We decided to have a little photo shoot in the backyard and my wife was able to snap this perfect shot! If you know our daughter, then you know it is no easy task getting her to stay still for a picture. This moment snapped in time will be one of my most cherished memories for the rest of my life. Winning this award, especially the Audience Choice award, is so humbling and incredible! To have this picture chosen by other Star Wars fans amongst so many other amazing shots is such an honor! We just want to take the opportunity to again thank everyone who voted for us! We are so grateful and appreciative! Thank you also to Star Wars and Disney for the amazing opportunity! May the Force be with you always! You Think This Is Weird…Wait Till You See the Egg by Aaron A. The way I became a Star Wars fan is the reason why I still love it today — it’s a chance to just relax and get drawn into a world where the stress of everyday life can’t get to me. With my two young children we can enjoy it together, and they have the opportunity to experience the fun and adventure that caught my attention all those years ago. To just try to be a part of the fantastic Star Wars universe. It’s been such a big part of my life since I was young and the opportunity to have my name attached to even a little piece of it was my main focus. Like nearly every Star Wars fan out there I have my own movie and creative ideas floating around my head and to have a way to express that with like-minded fans is incredible. Winning a Star Wars Fan Award is such a great moment, it’s going to be an awesome way to show my children that you can achieve things if you just put yourself out there and try. 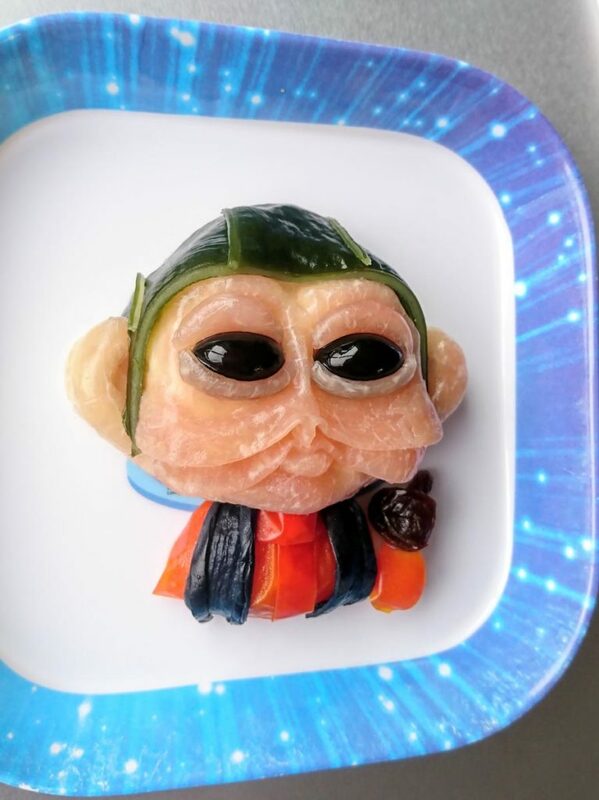 Nien Nunb Prosciutto Salad by Atsuko W.
I have been watching the movies since I was a little, but I think that I have gradually understood [it more] deeply since becoming an adult. Now my son is a Star Wars, fan so we enjoy it together. 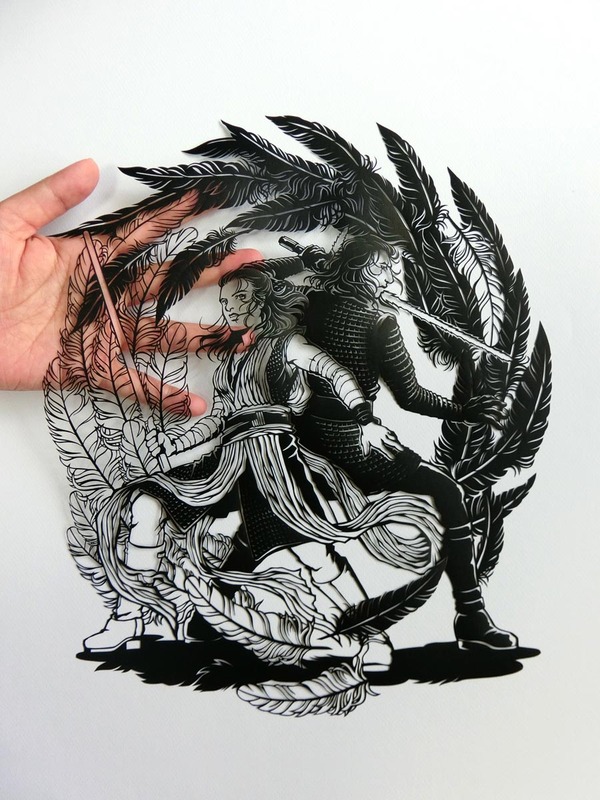 All the materials of the work are familiar. Work was done in the kitchen with chopsticks, kitchen scissors, and petty knife. I shot it using a smartphone on the dining table. After shooting, I ate everything. My dream is to have work on the Star Wars website, so I’m very happy. A Dog Hope by Kazuya O.
I saw Episode IV at a movie theater as a child. Since then, I’ve been a Star Wars fan. 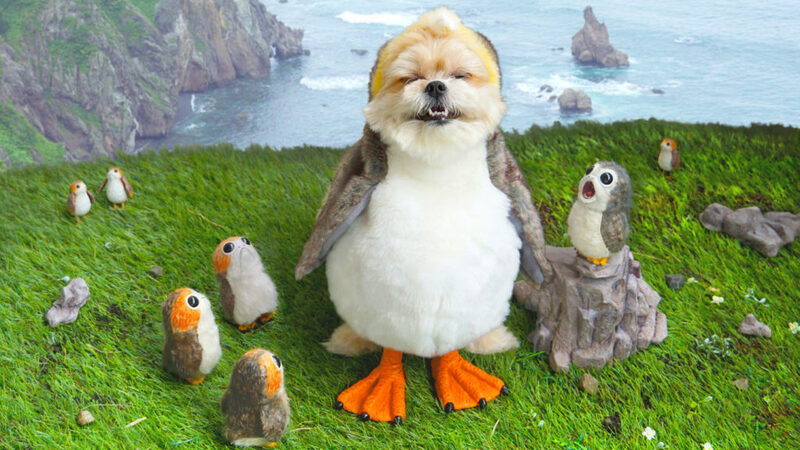 I love Episode VIII’s interaction between Chewbacca and the porg. So the idea was that I wanted my dog to interact with a porg. Of course, this honor is a treasure of a lifetime. Thank you very much. It may be an exaggeration, but I feel like a part of Star Wars history. I was introduced to Star Wars when I was around five years old by my dad and grandad, who are huge fans. I would sit and watch the original trilogy with them on the weekends and they would also encourage me to collect action figures. 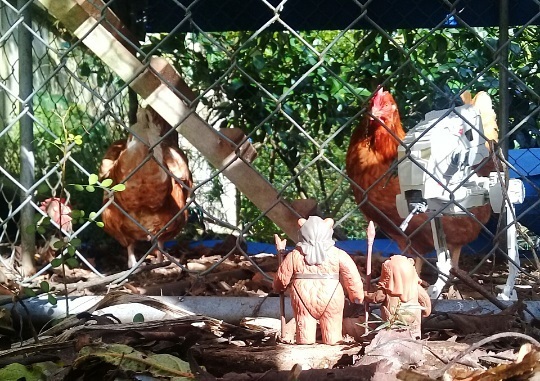 Star Wars turned into a sort of family tradition, and now I share it with my own family. Rey was the main inspiration for my photo. My hobby is action figure photography and I build all of my sets from scratch using recycled materials, pretty much the same way Rey scavenges for parts. It just felt right for me to take that concept and recreate with an action figure. It validates my hard work and passion for the 3.75” line of toys that I have loved and cherished since I was a child. Having my art recognized publicly is surreal and makes me very grateful and encourages me to keep on sharing my work with this community of fans and creators who have inspired us since we were kids. Vintage Joy: In Between Star Wars and Disney by Adam M.
The Empire Strikes Back is the first film I remember seeing in a theater, and it remains my favorite film of all time. I have a weird memory of staring into the mirror and attempting to fast forward time so I could know if Vader REALLY was Luke’s father or not. It didn’t work. What was the inspiration for your Star Wars Fan Awards entry? 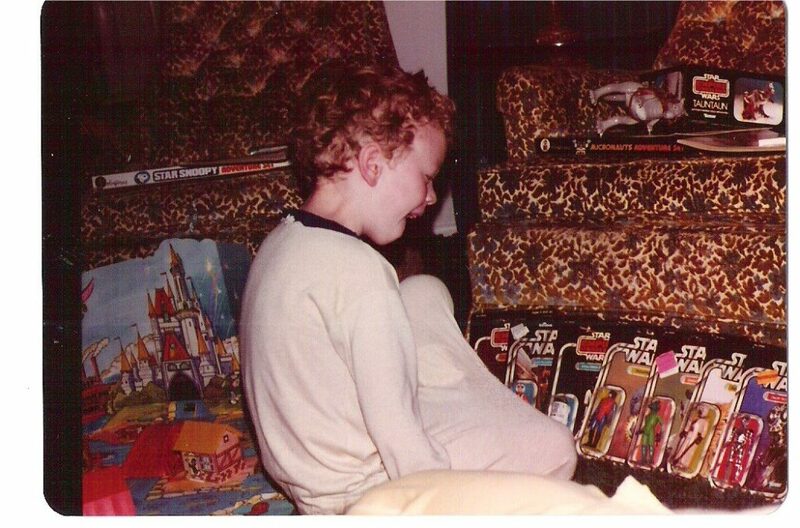 I have a glass case where I keep a few of my childhood Star Wars toys on display, and this photo of me at age five sits atop the case. While there are plenty other vintage photos of me with various Star Wars memorabilia, I’ve always felt this one was particularly special. You can see how filled with joy I am, and the connection of Star Wars and joy has never dissipated for me. It seems preposterous, to be honest. I know there were many, many equally deserving entries. I just happened to be really happy in a photograph. Watch The Star Wars Show‘s Star Wars Fan Awards 2018 special below!